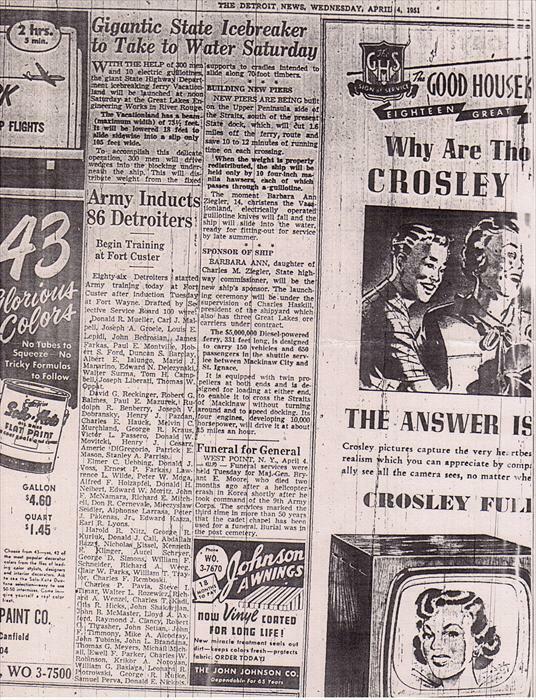 4/3/1951 "Eighty-six Detroiters started Army training today at Fort Custer (Augusta, Michigan) after induction Tuesday at Fort Wayne (Detroit, Michigan). 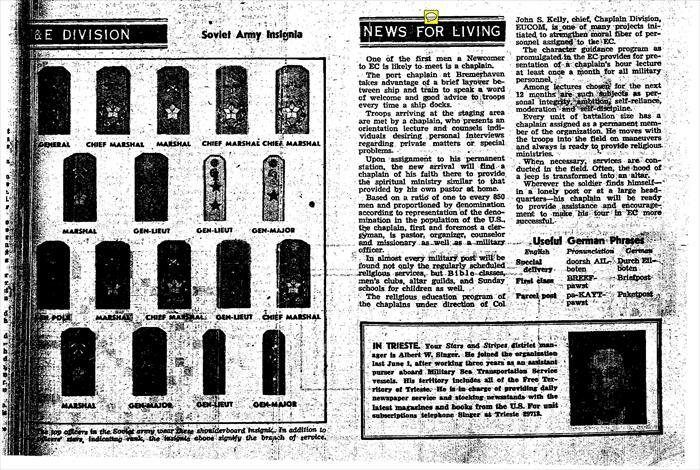 Drafted by the Selective Service Board 100..." I found this information in the Detroit News, 4-4-1951, P. 13 on microfilm at the Detroit Public Library. 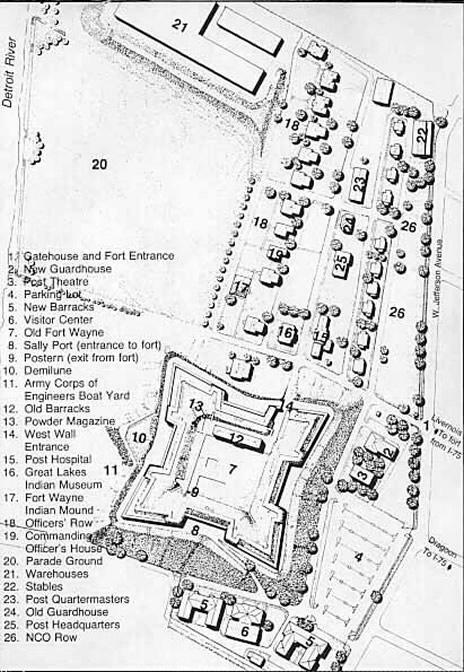 At Fort Wayen, the men were sworn in and had another physical exam. 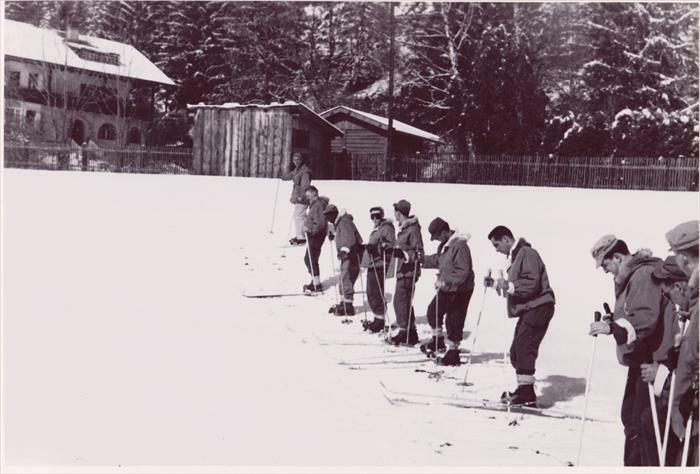 The first took place in January or February of 1951. The men were bussed to Fort Custer. Enroute a "rest call" took place at Jackson Prison. Once at Fort Custer, the men had yet another physical exam, immunizations, a buzz cut and were given gear. 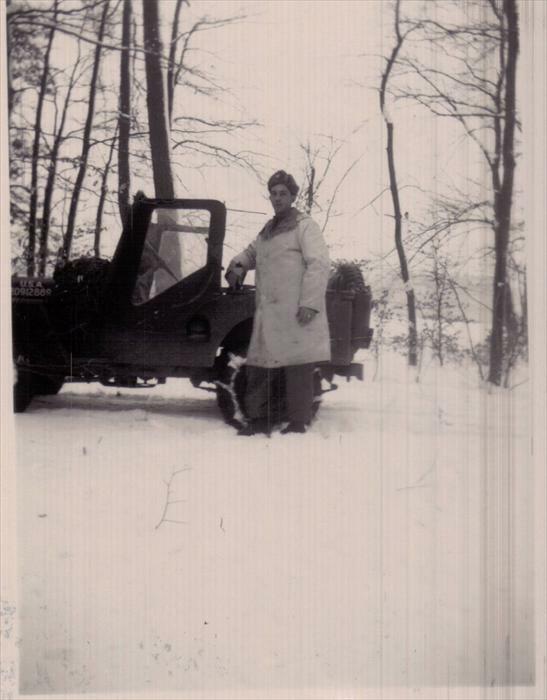 Based on what the men remember, Dad was at Fort Custer about a week give or take a few days. The Camp Breckinridge bound men (others trained at Fort Hood) boarded a train and by dawn the next morning reached their destination. 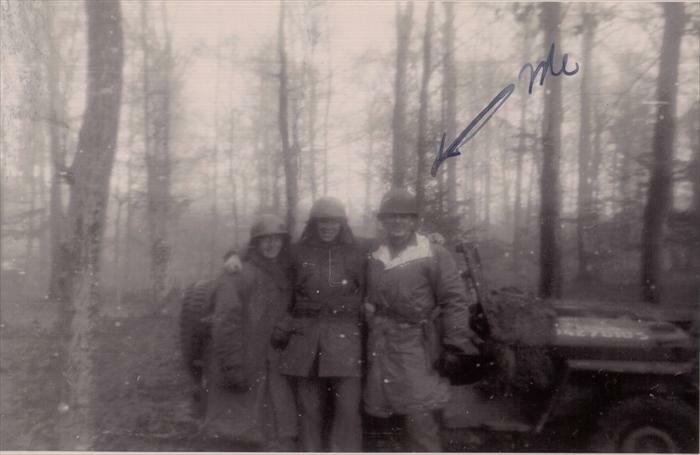 Taken when the 1st Inf. Div. was headquartered in Darmstadt. Left to right-Smitty (Frederick J. Smith), Ray Byers, Stretch (John Moskites) and Bence Whitley. All but Smitty are with us today. Bence Whitley, HQ CO defense platoon, requested to go to Korea. 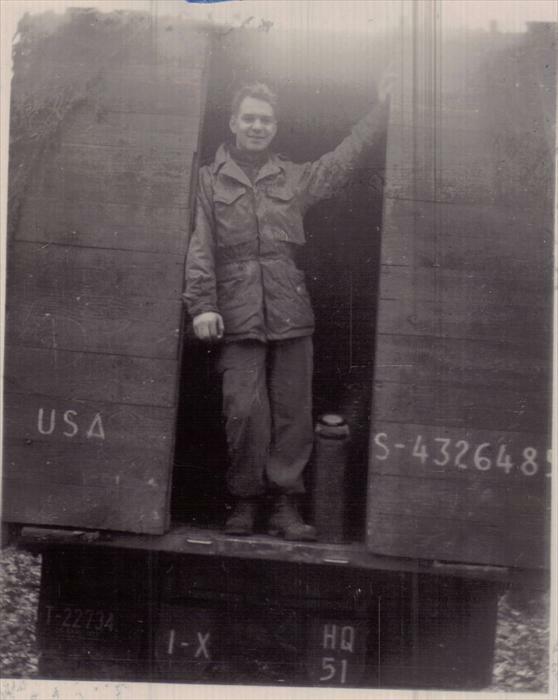 He died as "SGT 179 INF 45 INF DIV" in Korea one day after his 23rd birthday in November 1952. It is known he died of an illness. 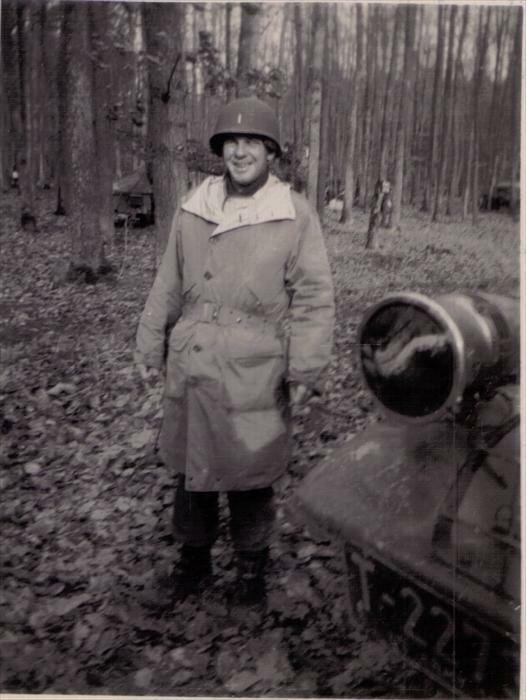 Carl Schifferer photo, 1st Inf. Div. 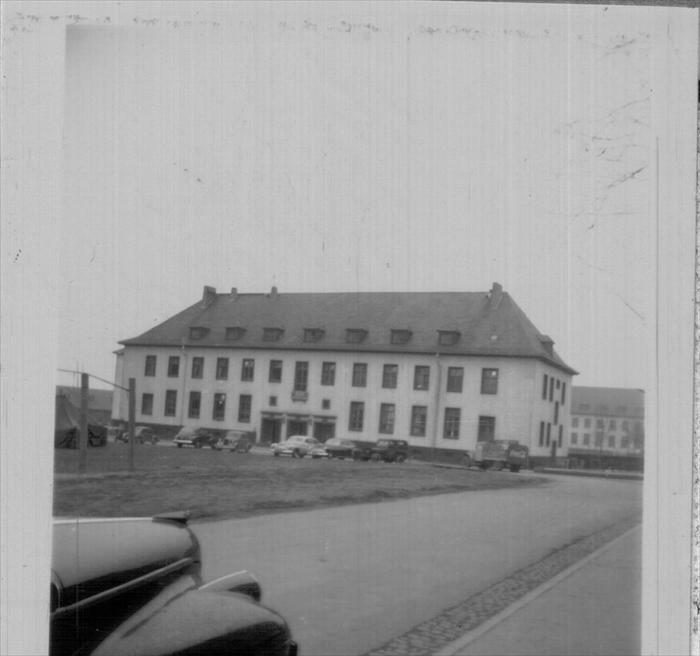 HQ CO. Headquarters moved from Bad Tolz to Darmstadt in January 1951 followed by another move from Darmstadt to Wurzburg in September 1952. This was one of the signs at Cambrai Fritsch Kaserne, Darmstadt. 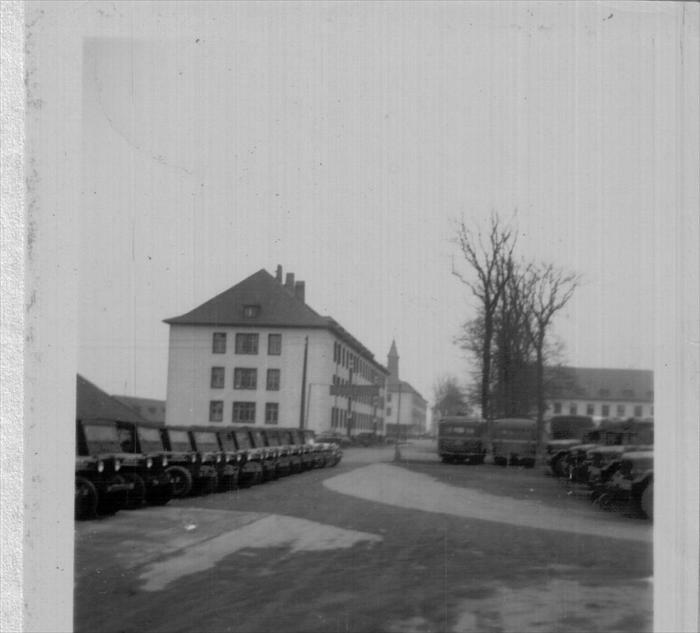 1st Infantry Division HQ CO men in Garmisch, Germany (1951-1953). Dad is at the left wearing light-colored trousers. 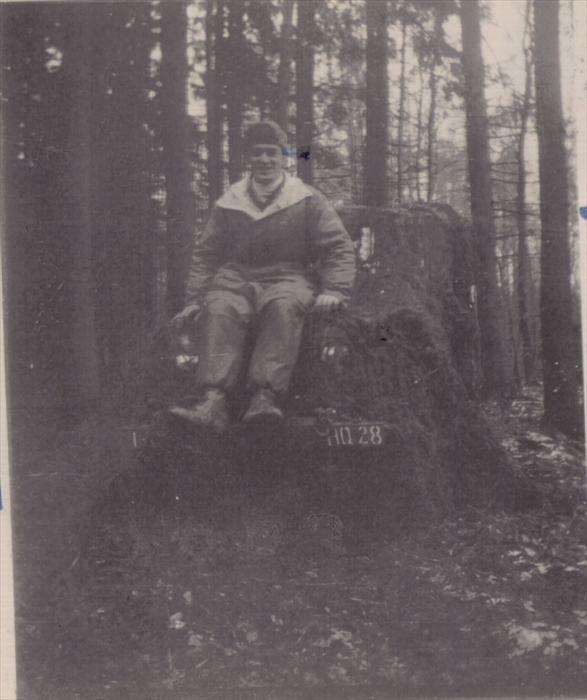 Smitty?, Iusiak, "English", 1st Inf Div Hq Co men on maneuver, Germany, 1951-1953. Dad, stooped, Smitty and Cpl. 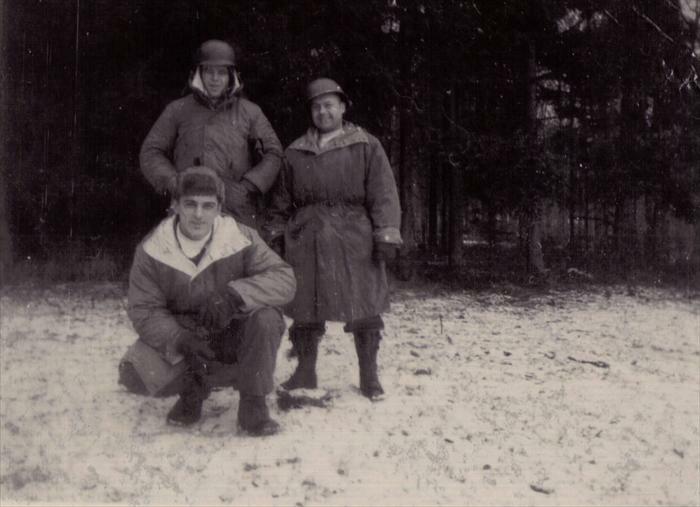 Clarence Werre (at right), on maneuver in Germany, 1951-1953. 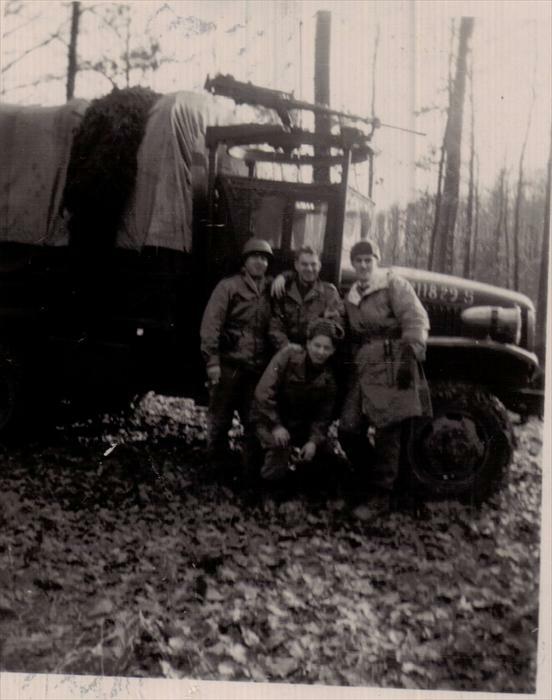 Dad wrote on the back of the photo the men were awarded white scarves for so much time on maneuvers. 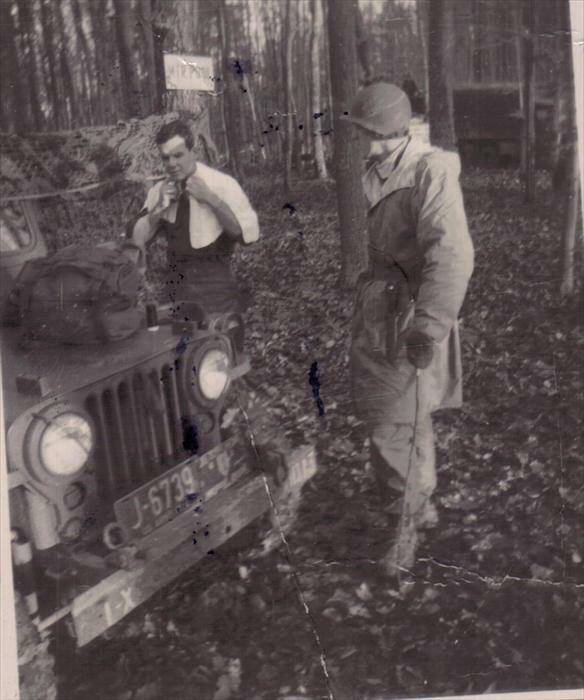 Dad (left,) "English, "Stretch", Iusiak (stooped) on maneuver, 1951-1953, Germany. 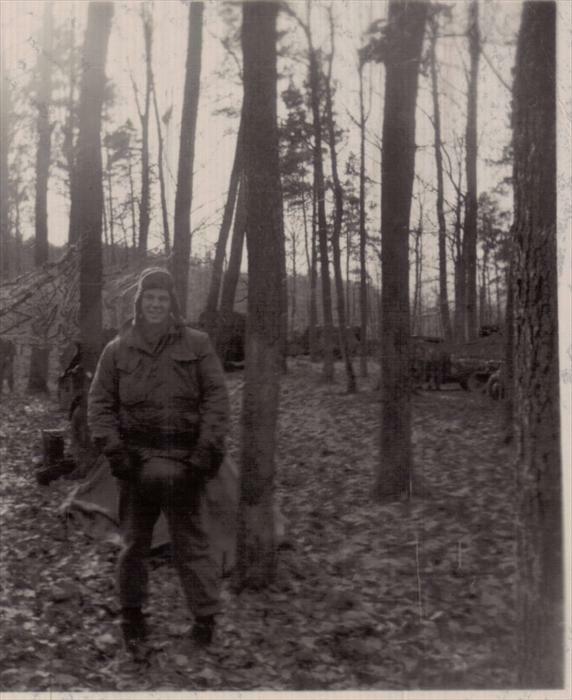 Smitty on 1st Inf Div maneuver, Germany, 1951-1953. 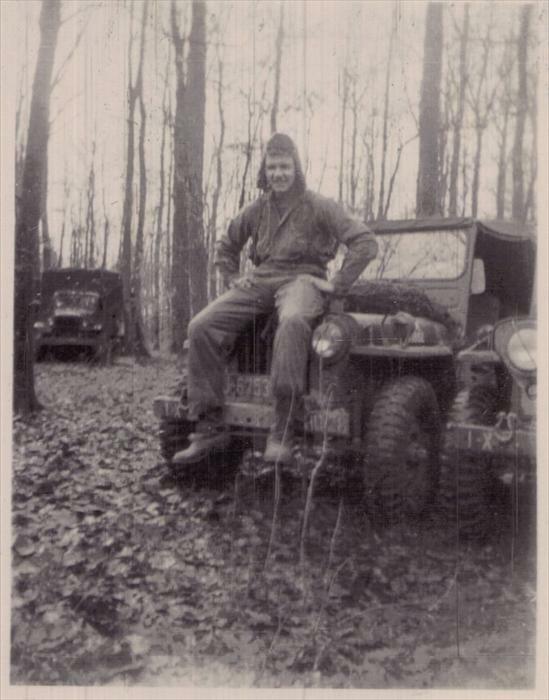 John Tubinis, PFC, 1st I.D. HQ CO, (right) and Lt. Charles Grimsley shaving. Taken on a maneuver in Germany. 1951-1953. Frenchie, Smitty and Dad. 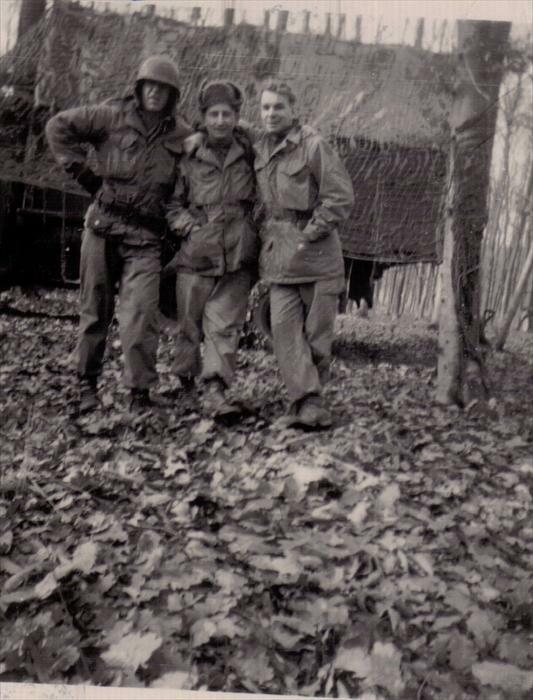 1st ID HQ CO men on maneuver, "Stretch", Iusiak and "English," right. 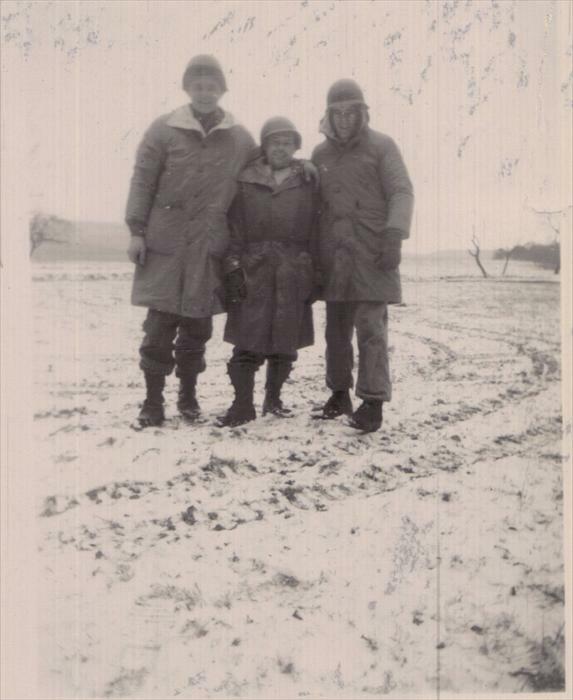 Unknown, left, "English," (Cpl. 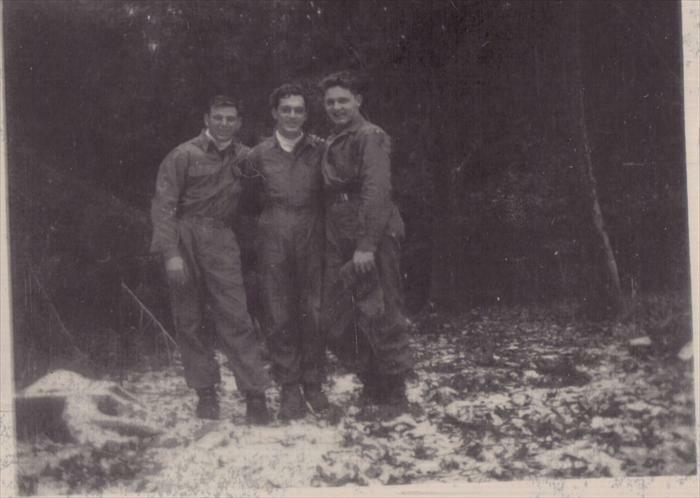 Harry J. English), John Tubinis, (Dad), Cpl. Edward Iusiak, stooped. 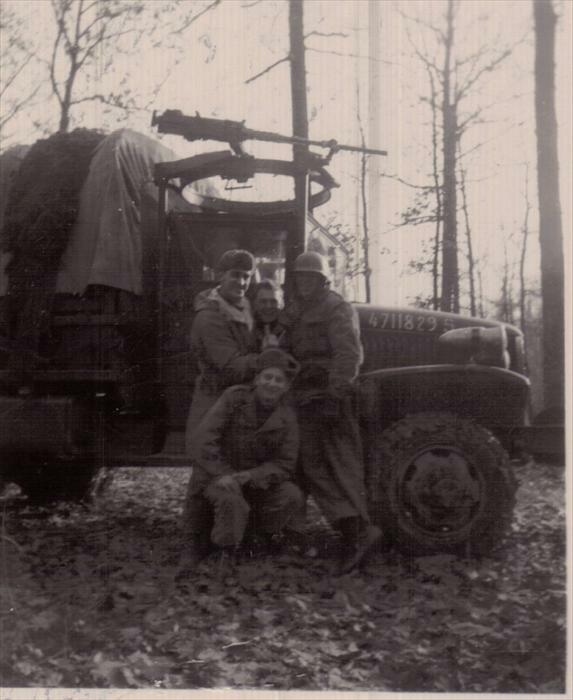 101st Airborne, 516th Reg. "G" Company Basic Training graduation photo. 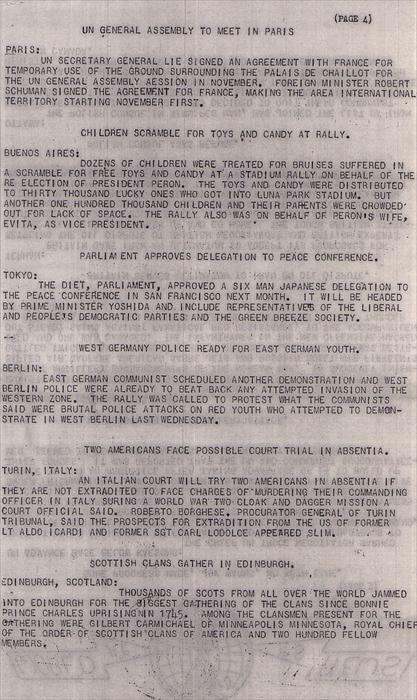 P. 5 of 5. 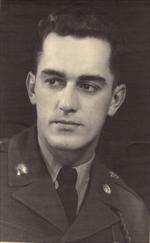 Charles Remboski of Dearborn, MI added. "Like" John Tubinis at Camp Breckinridge on Facebook. 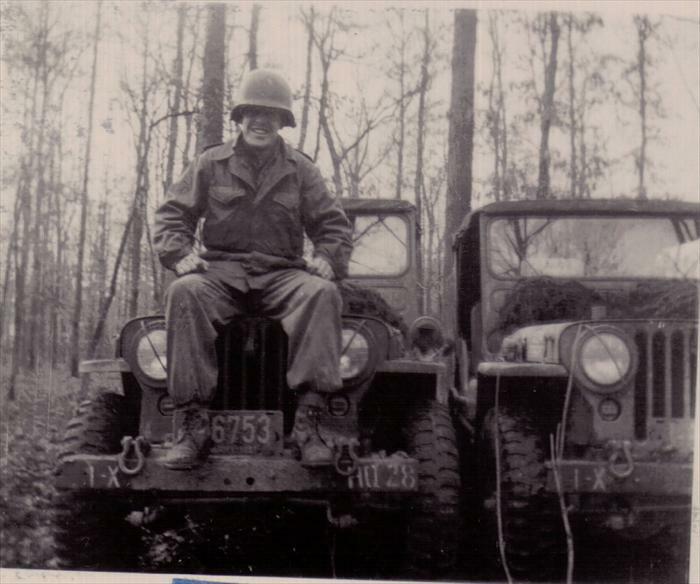 101st Airborne, 516th Reg. "G" Company Basic Training graduation photo. P. 4 of 5. 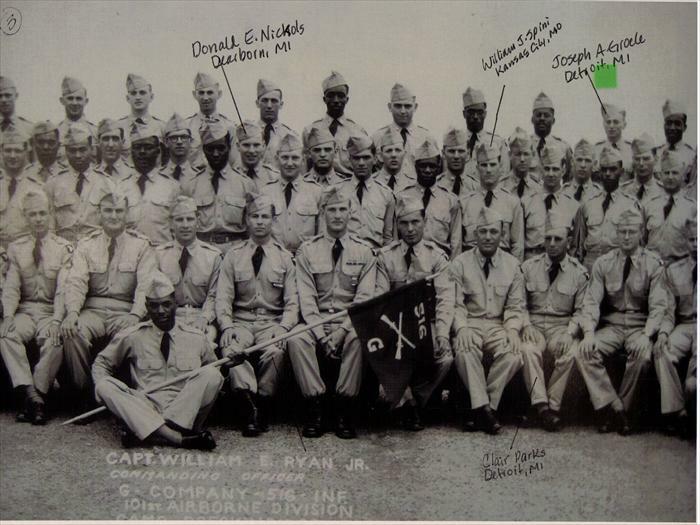 101st Airborne, 516th Reg. "G" Company Basic Training graduation photo. 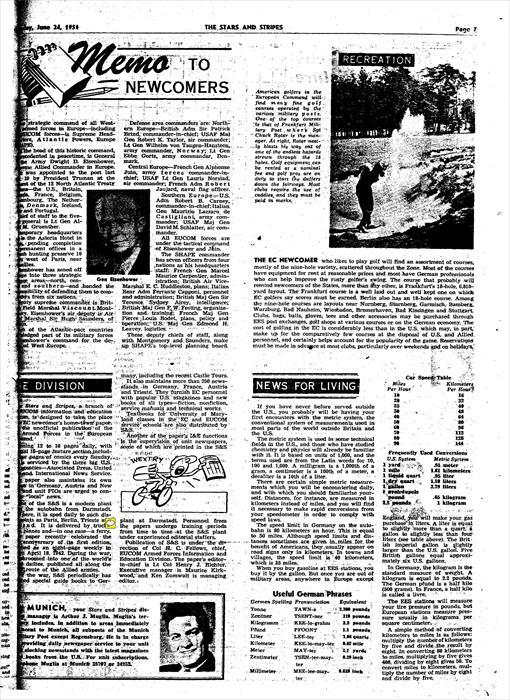 P. 3 of 5. Frenchie, Dad and Werre. Smitty, Werre and Dad. 1st Inf. Div. 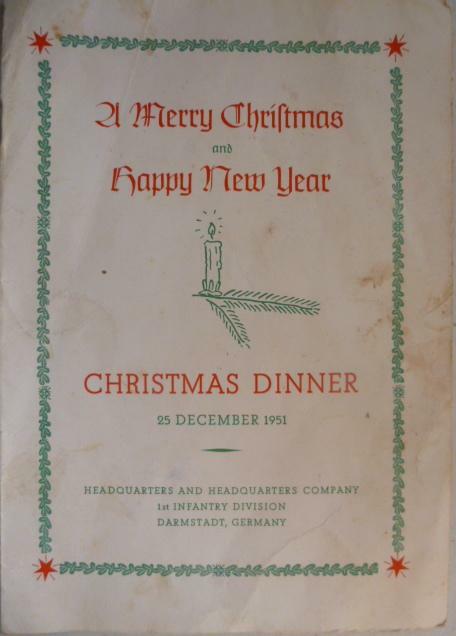 HQ CO 1951 Christmas menu and roster-provided by Sgt. Glenn R. Schriner. Christmas menu and roster. Christmas menu and roster. Christmas menu and roster. Cpl. Harry J. English is found in my father's photos. Christmas menu and roster. 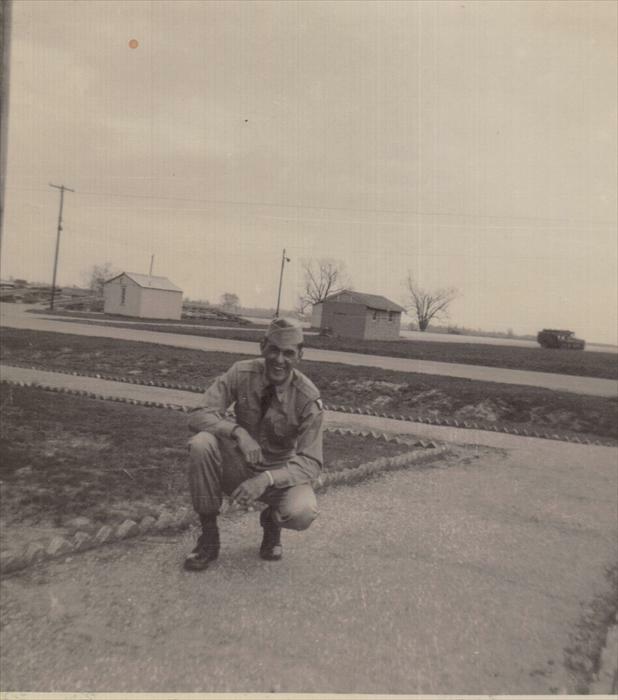 Lt. Charles Grimsley is found in my father's photos. Christmas menu and roster. Christmas menu and roster. 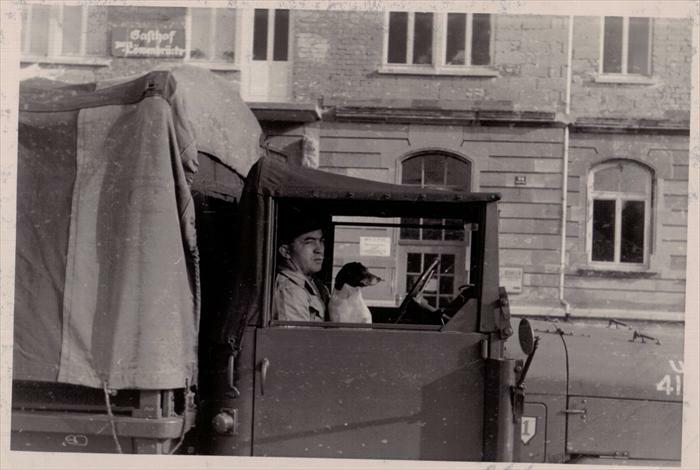 1st Infantry Division HQ CO soldier with mascot taken near the Lion Bridge in Wurzburg, 1952-1953. 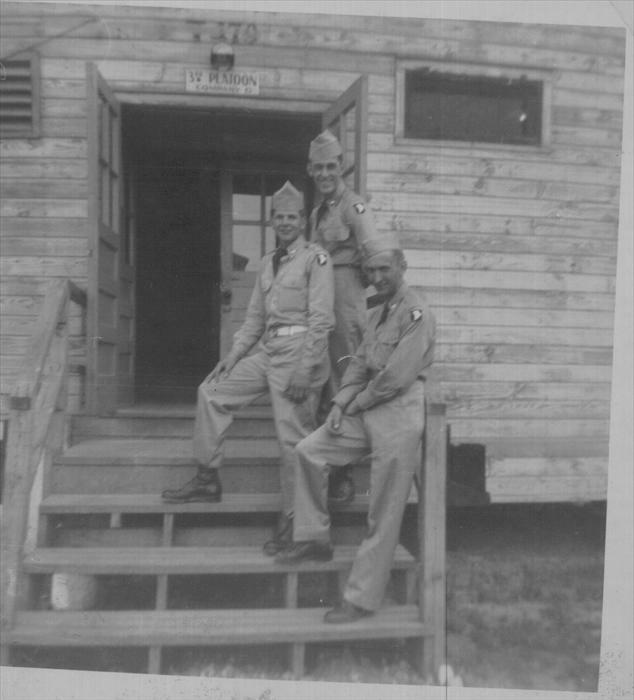 Stretch, Werre and Smitty, 1st ID Hq Co men on manuever 1951-1953 Unknown HQ CO soldier. 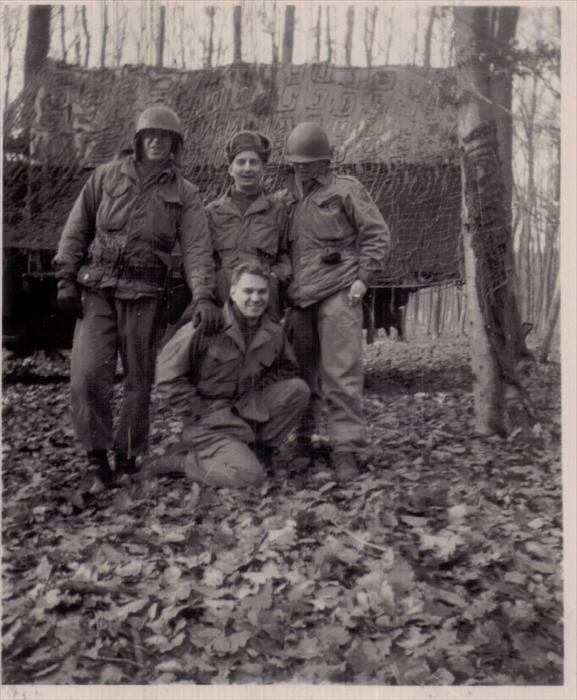 101st Airborne, 516th Reg. 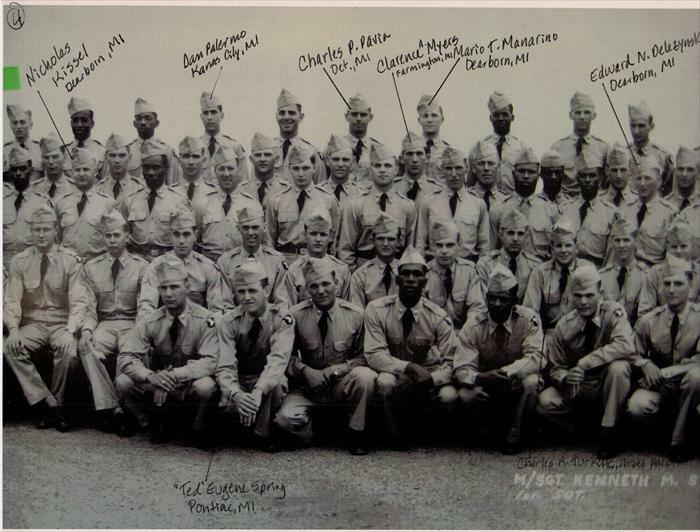 "G" Company Basic Training graduation photo. 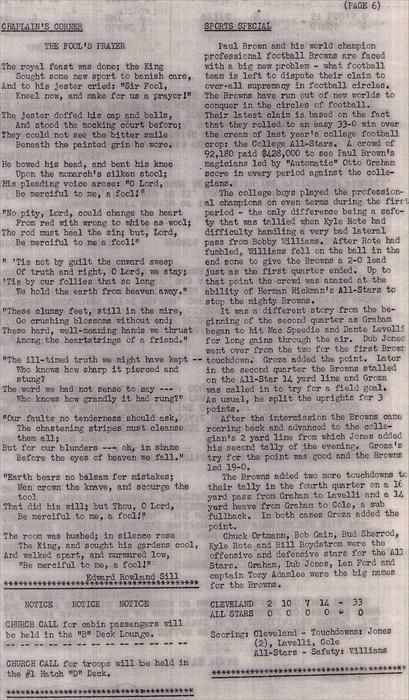 P. 5 of 5. 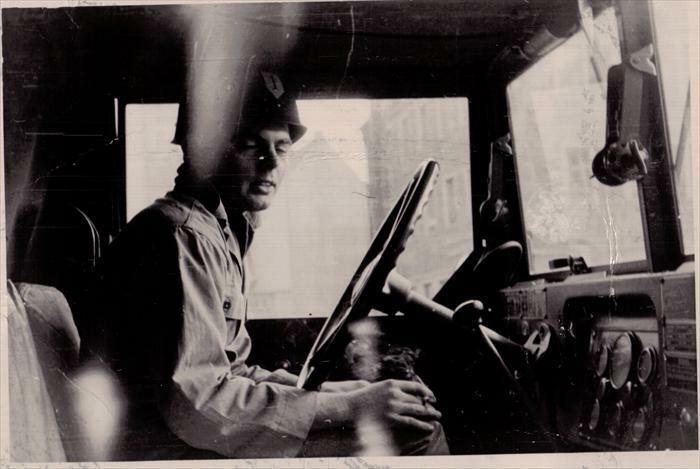 Charles Remboski of Dearborn, MI added. "Like" John Tubinis at Camp Breckinridge on Facebook. 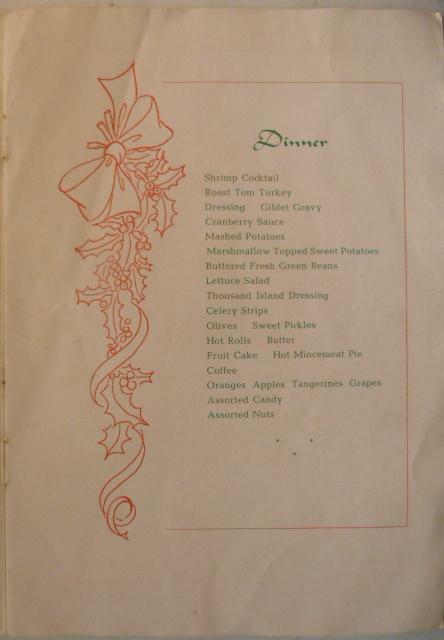 Christmas menu and roster. Cpl. 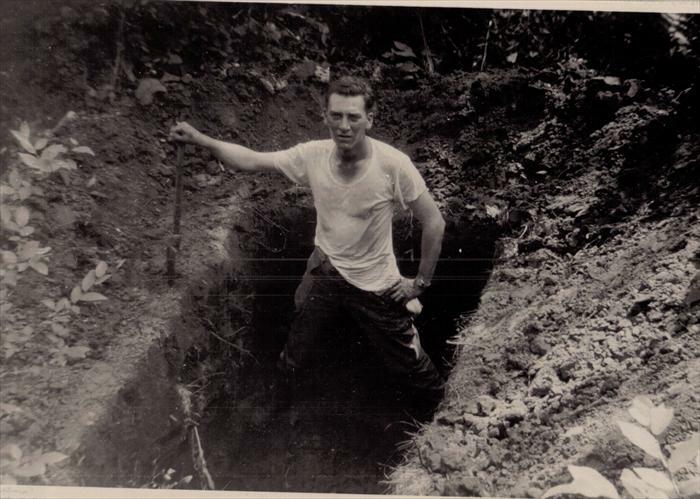 Clarence Werre, Pvt. John Moskites, Pvt. 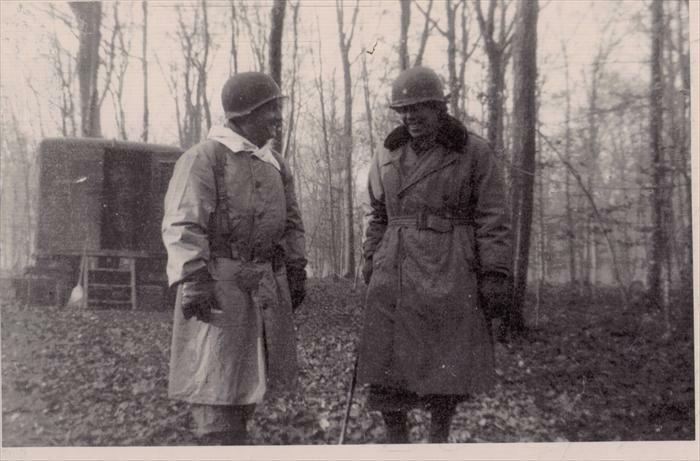 Frederick Smith and Pvt. Joseph Hershberger are in my father's photos. 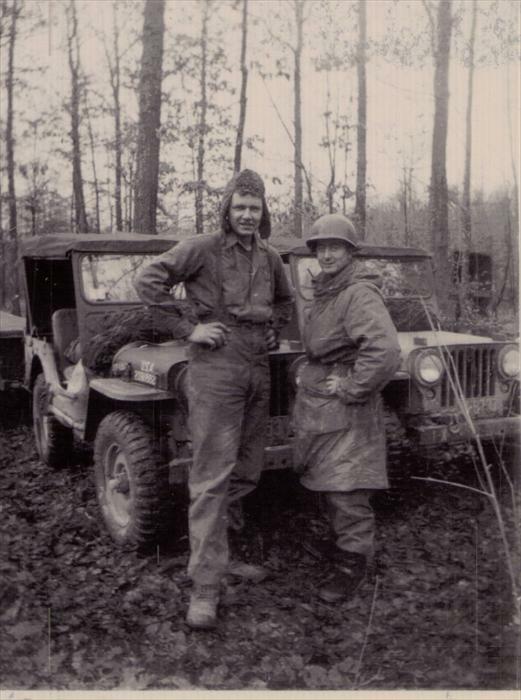 Stretch and Frenchie (Joe Hershberger) on maneuver, Germany, with 1st Inf. Div. HQ CO. Unidentified soldier on maneuver. Dad's 1st ID HQ CO, 1951 license plate. 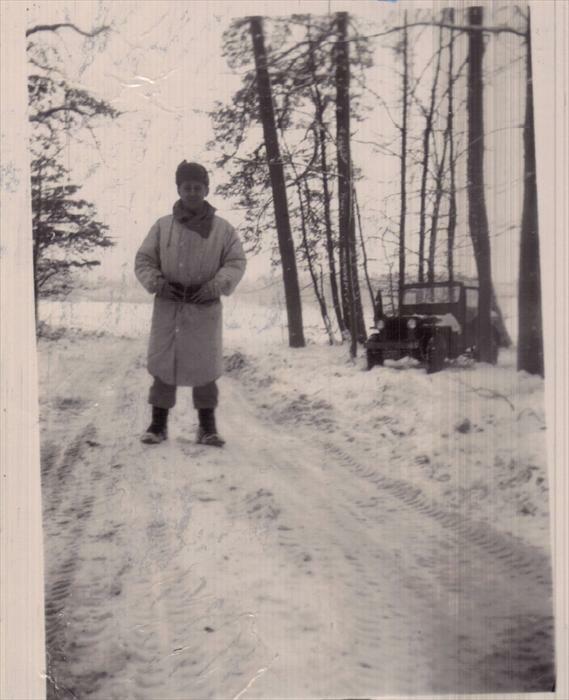 Unknown 1st Infantry Division Soldier on maneuver in Germany, 1951-1953. 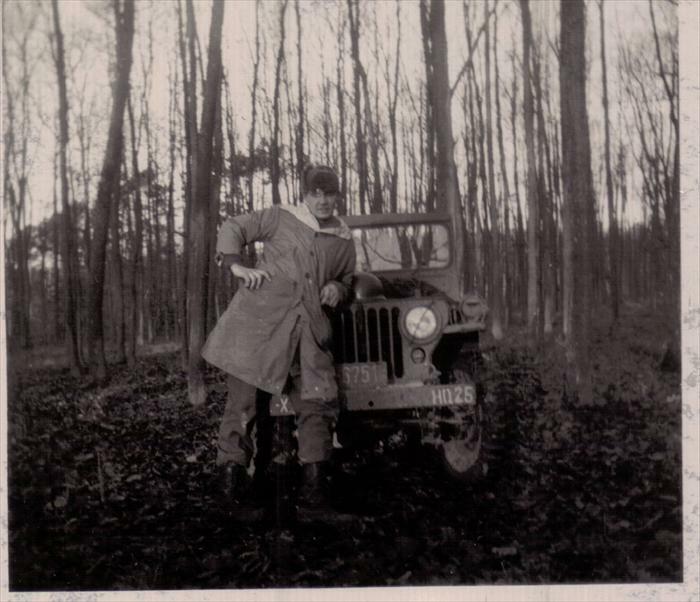 Dad on maneuver, Germany, 1951-1953. 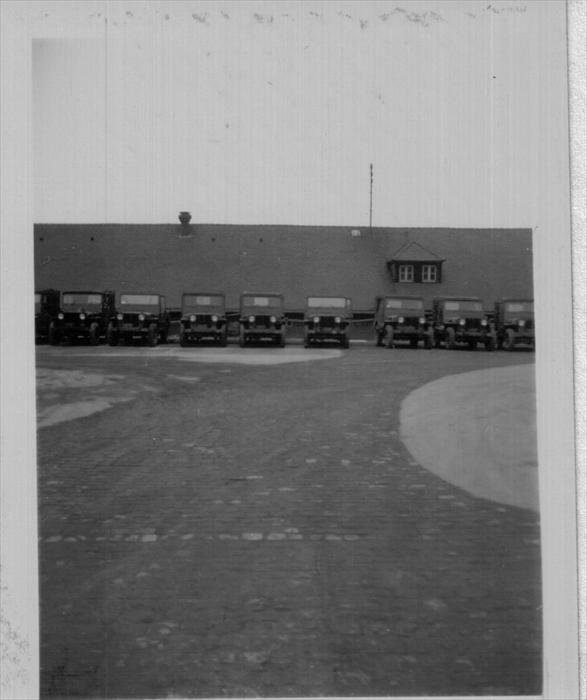 "English" at parts truck on maneuver, Germany, 1951-1953. 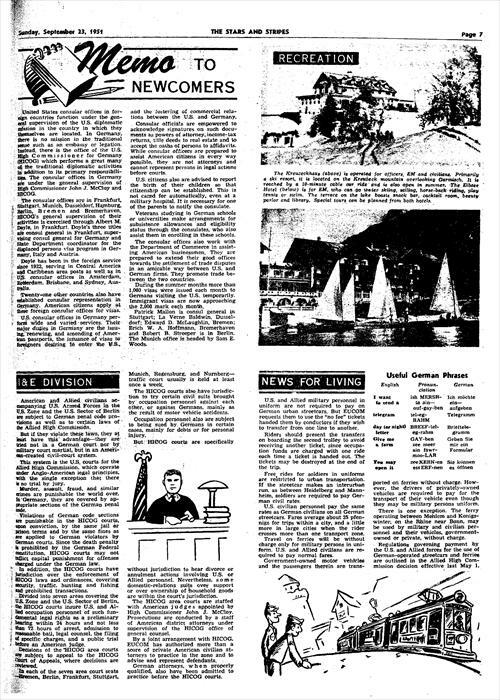 John Tubinis on maneuver in Germany. Standing in front of a deuce and a half. 1951-1953. 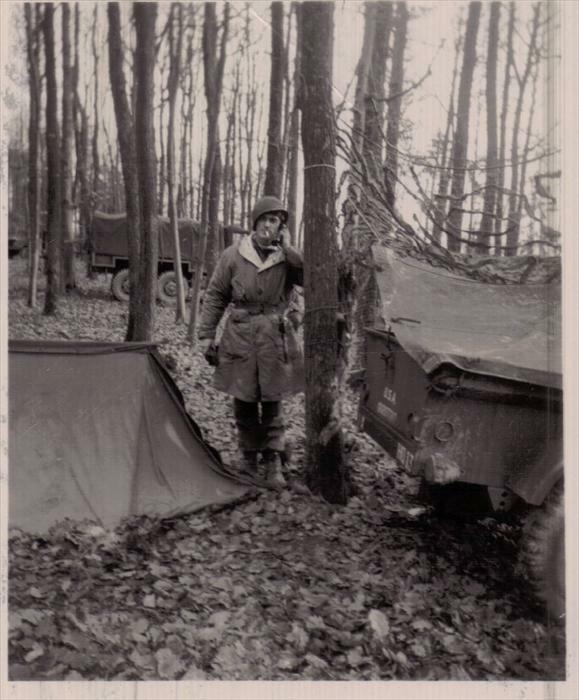 Unknown 1st Infantry Division Soldier on maneuver in Germany, 1951-1953. "Stretch" on maneuver with Dad. 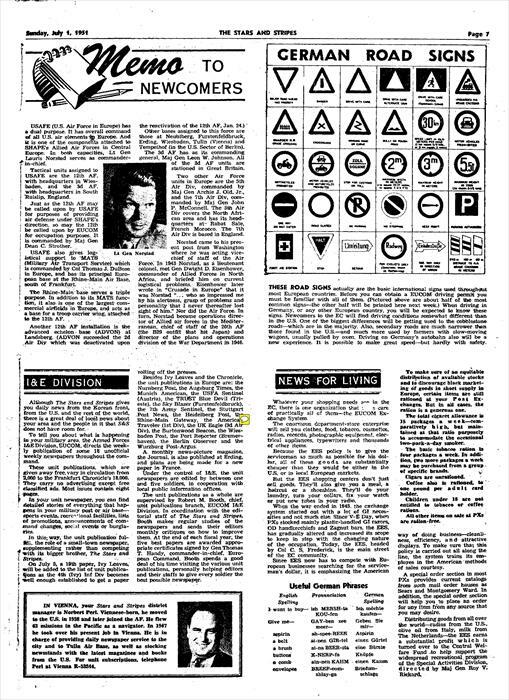 Stars and Stripes, 9-2-1951. 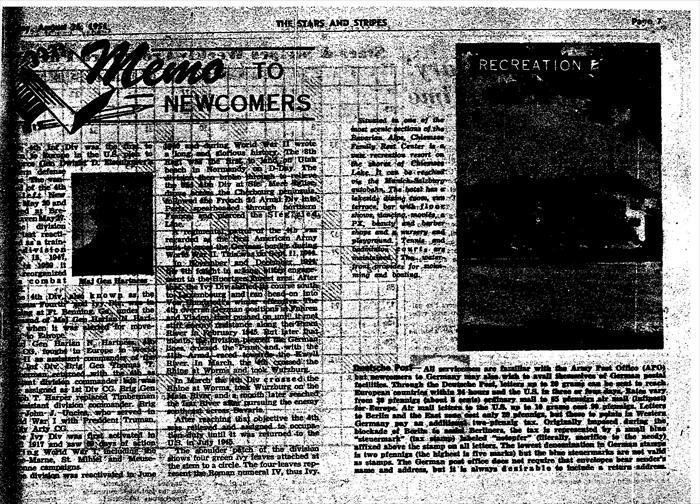 Source: Newspaper Archives.com Stars and Stripes, 8-26-51, bottom of page due to file size. 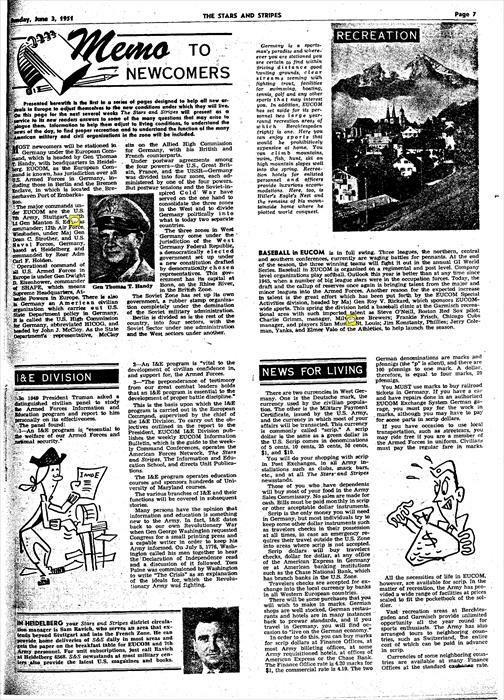 Stars and Stripes, 8-26-51, top of page due to file size. 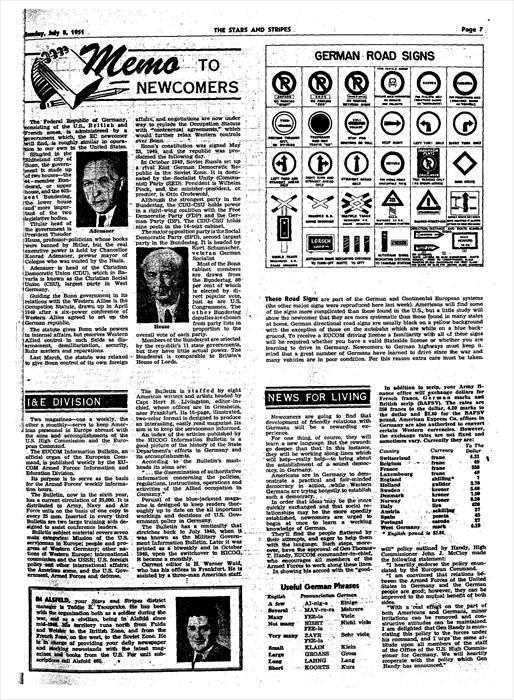 Stars and Stripes, 8-19-1951. Bottom of page due to file size. 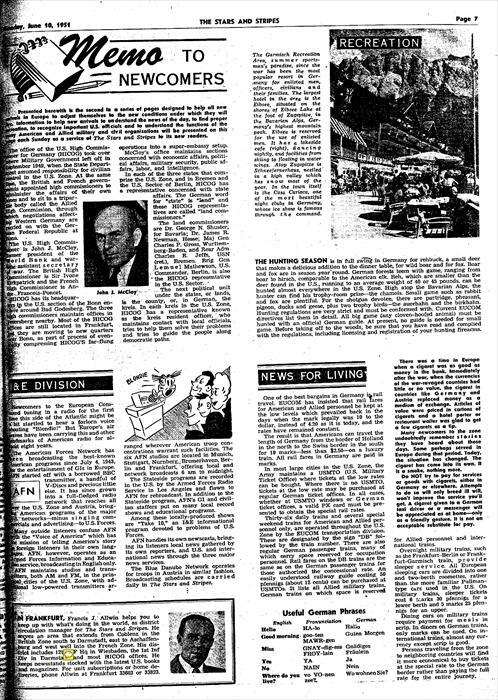 Stars and Stripes, 8-19-1951. Top of page due to file size. 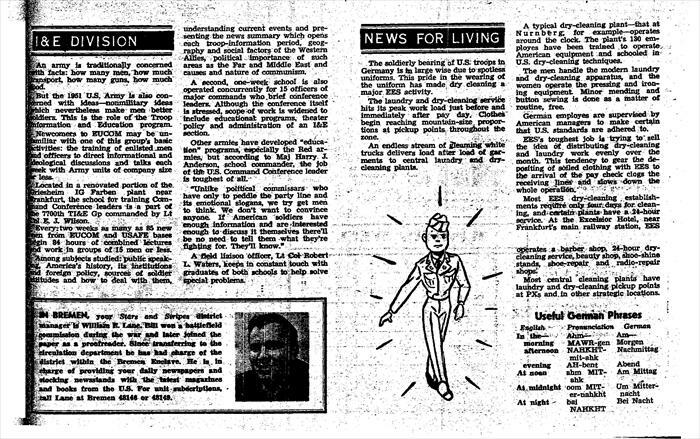 Stars and Stripes, 8-12-1951. 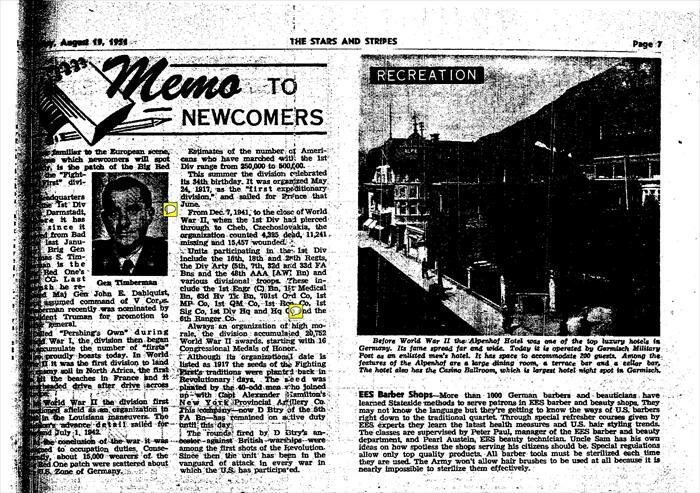 Stars and Stripes, 8-5-1951. Bottom of page due to file size. 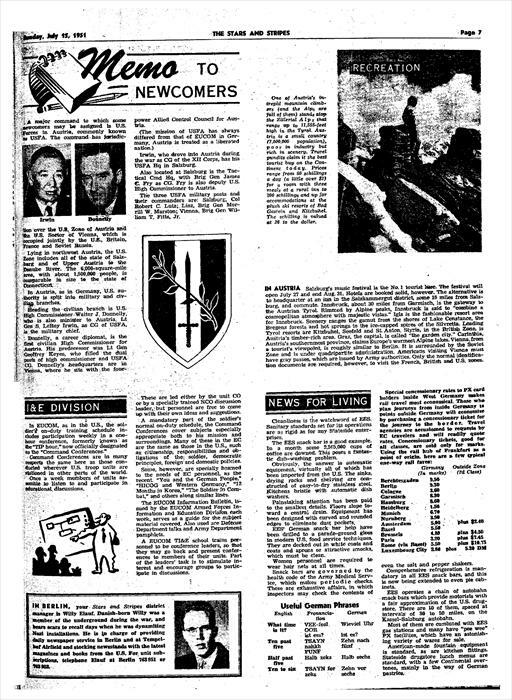 Stars and Stripes, 8-5-1951. Top of page due to file size. Stars and Stripes, 7-29-1951. Stars and Stripes, 7-22-1951. Bottom of page due to file size. Stars and Stripes, 7-22-1951. Top of page due to file size. Stars and Stripes, 7-15-1951. 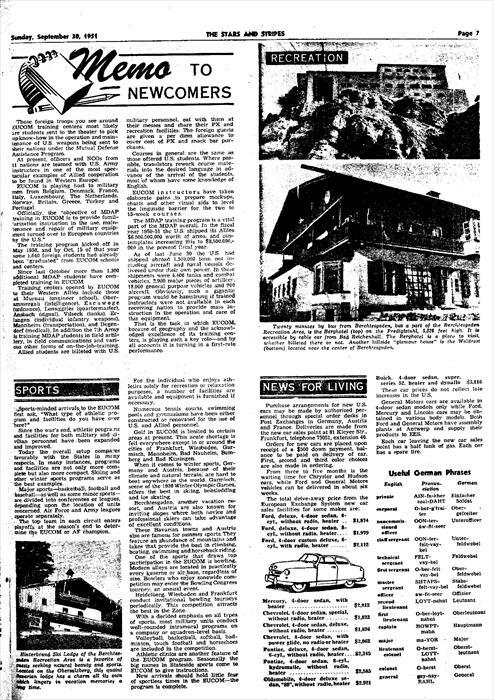 Stars and Stripes, 6-17-1951 Stars and Stripes, 6-10-1951 Stars and Stripes, 6-3-1951. 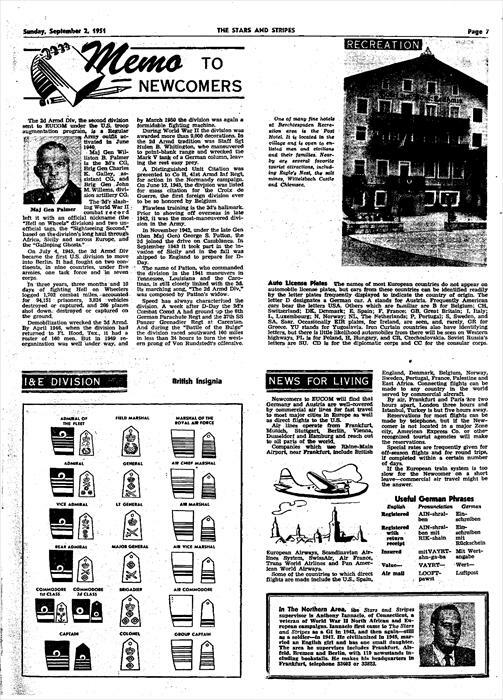 Source: Newspaperarchive.com. In January 1951, there were 86,000 troops in Germany. 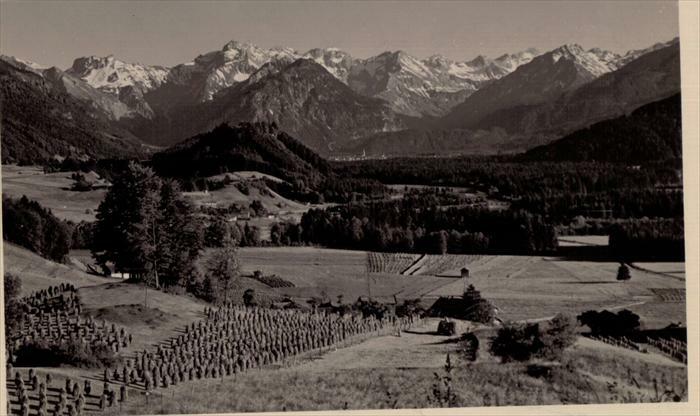 As the tension between Russia and Germany increased, by the end of 1951, Germany housed 234,000 soldiers. 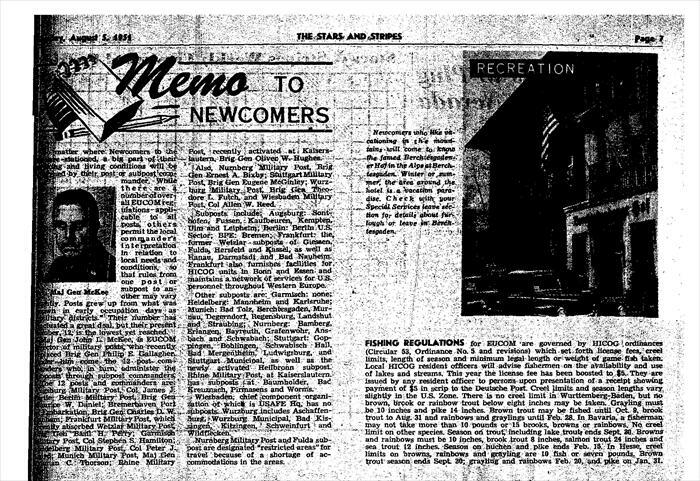 Please begin to read the "Memo to Newcomers" here for an understanding of the articles and articles following until the series ended in September 1951. 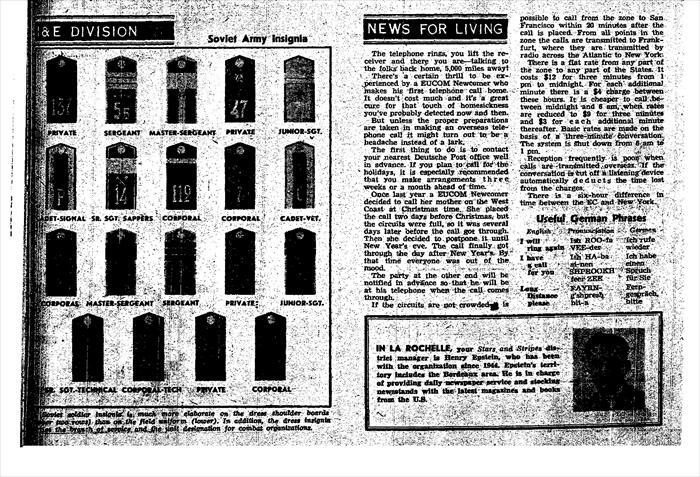 Detroit News article, Weds., April 4, 1951 listing 86 inductees. 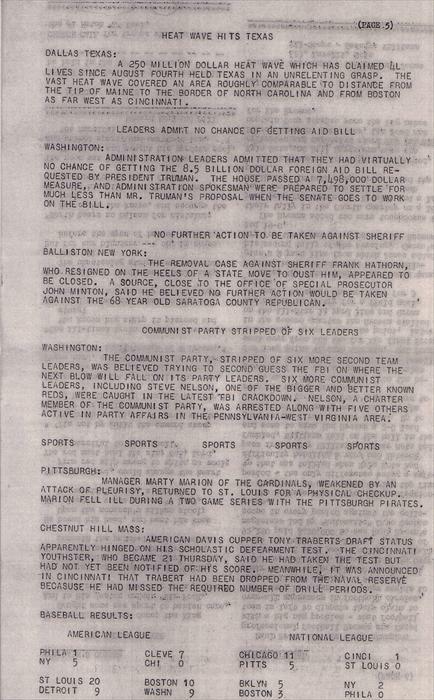 Dad's (John Tubinis) name is in the last paragraph. 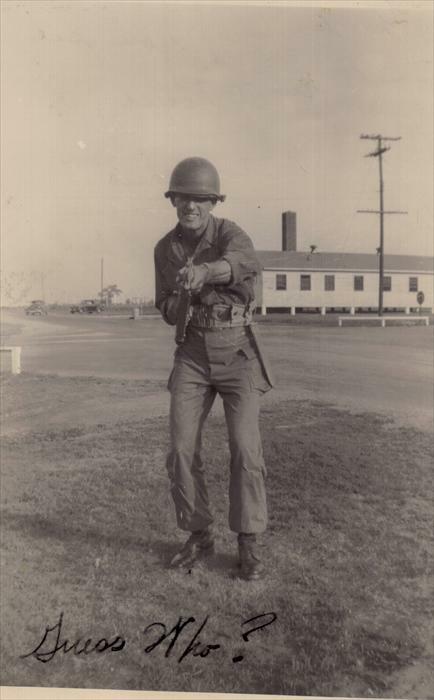 Many of the men are alive as of this posting and eager to talk about their time in Basic Training, Europe, Japan or Korea. The men lived in southwest Detroit or east Dearborn and were born in 1929. If you recognize any name, please contact me. Additional signatures. 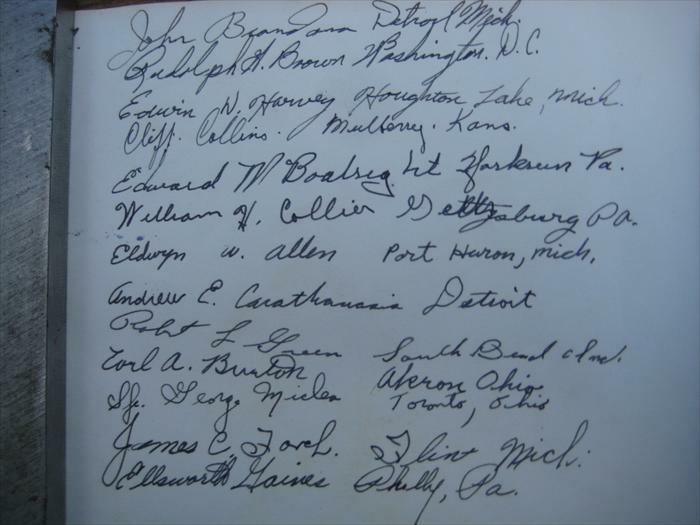 Signatures from Detroit and Dearborn (Michigan) men are tied to the Detroit News article, Wednesday, April 4, 1951 posted at an earlier date. 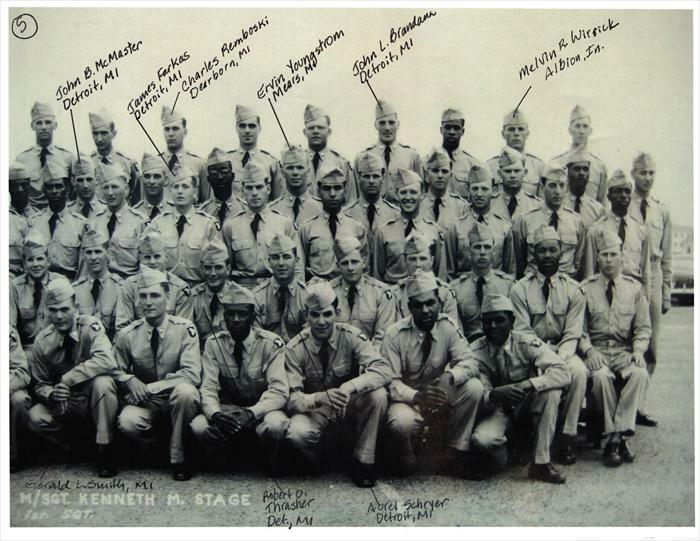 On Friday, June 8, 1951, the 101st Airborne Division, 516th Infantry Regiment, Company G graduation photo was taken. 1st, 2nd and 3rd platoons made up the company. 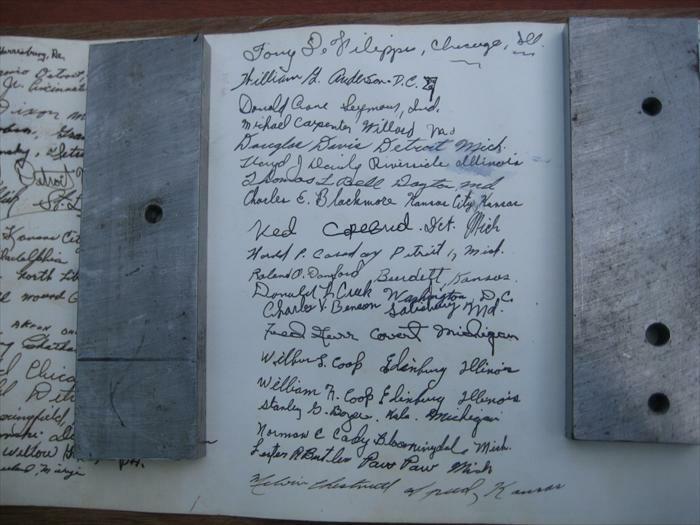 The three photos, posted separately, record some of the men's signatures. 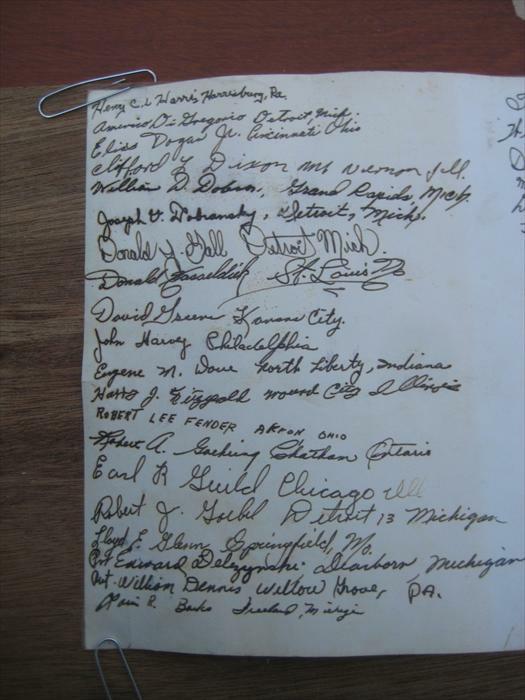 Mr. Joseph A. Groele, (named in the Detroit News article), provided me with these signatures and copies of the original photo. The original photo will be posted at a later date. If any names are recognized, please contact me through the webmaster. No hostile shots have ever been fired from this star-shaped fort built in the 1840’s to guard against a British invasion from Canada which never came. This third bastion to protect the river approach to the city was named for General “Mad” Anthony Wayne who accepted the surrender of Detroit from the British in 1796. It was a mobilization center for Union troops during the Civil War. Regiments from Fort Wayne served in Indian conflicts, the Spanish-American War, the Philippine Insurrection, and World War I. An active post in the 1920’s, it housed a Civilian Conservation Corps during the Depression. 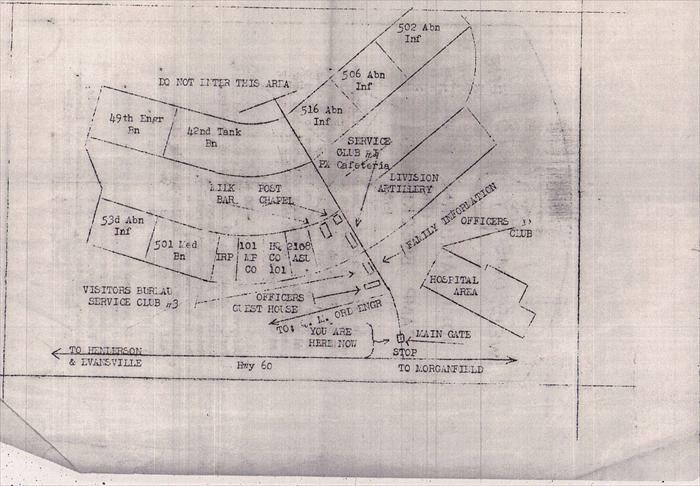 Fort Wayne was a wartime supply depot in World War II and an induction center during the Korean and Vietnam conflicts. Deactivated by the federal government in 1967, it now operates as a military museum under the auspices of the Detroit Historical Commission. (Michigan Historic Marker). Area 4, now a parking lot, replaced the building that the men were sworn in at. 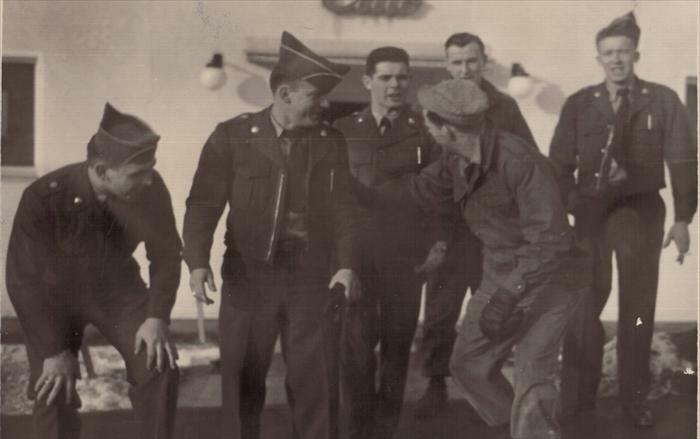 After the men had a brief furlough home following Basic Training and Light or Heavy Weapons training, most were bound for Europe. They made their way to Camp Kilmer by plane or train. They were ferried to the New York Harbor to board troopships sailing to Bremerhaven or a French port. 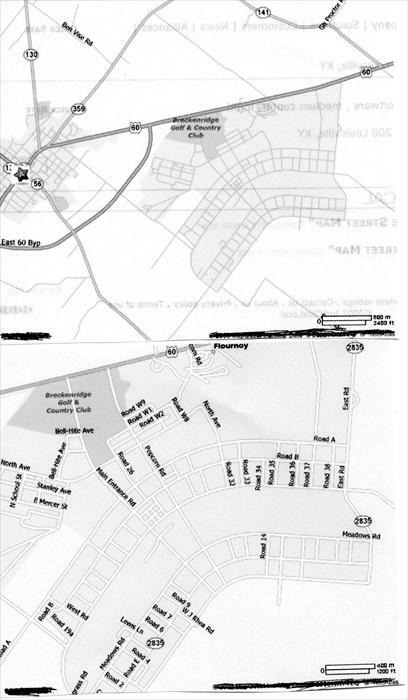 Map-Wikipedia. The next stop from Fort Wayne (Detroit, MI) was Fort Custer, near Augusta, Michigan. 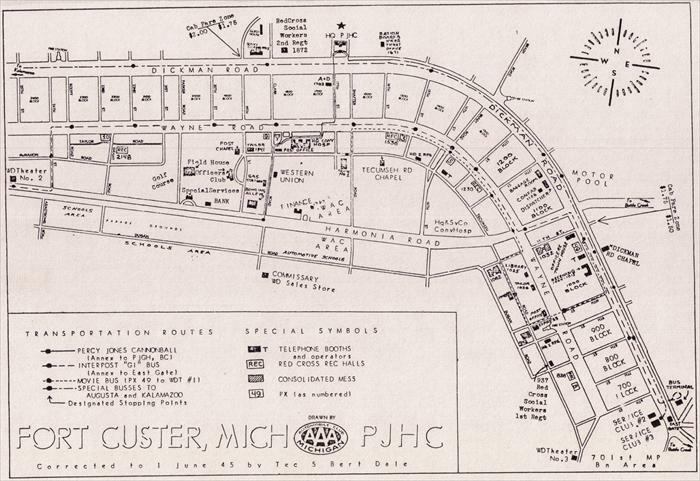 Map-As You Were: Fort Custer, Faye Clark. 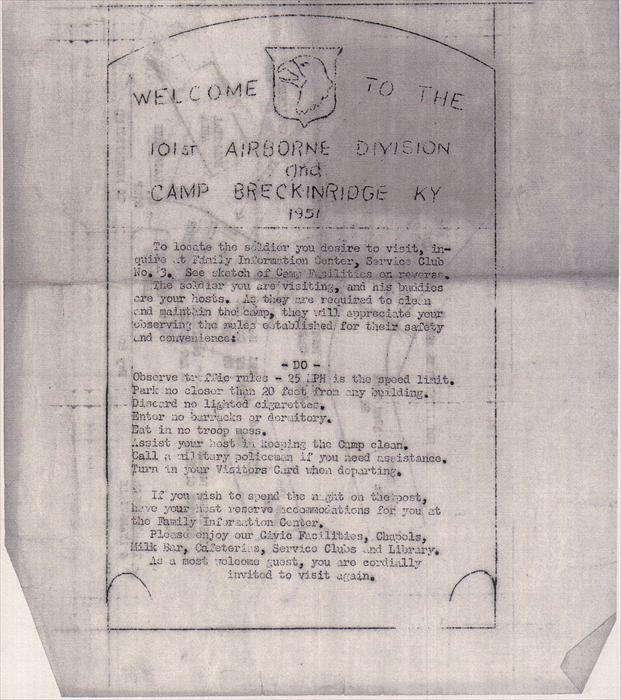 Here's a copy from Ken Klinger's Camp Breckinridge memorabilia. 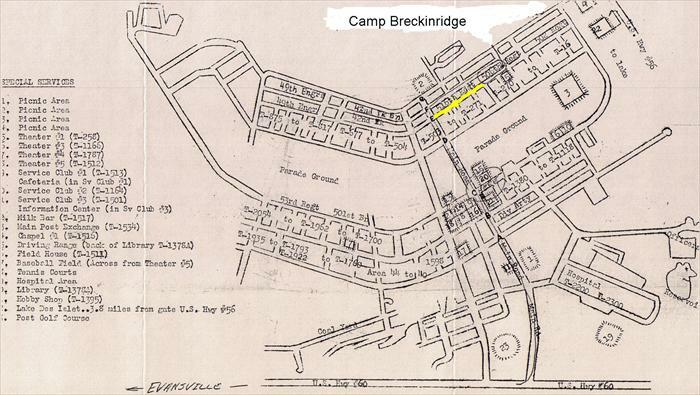 Ken Klinger memorabilia-Camp Breckinridge map. 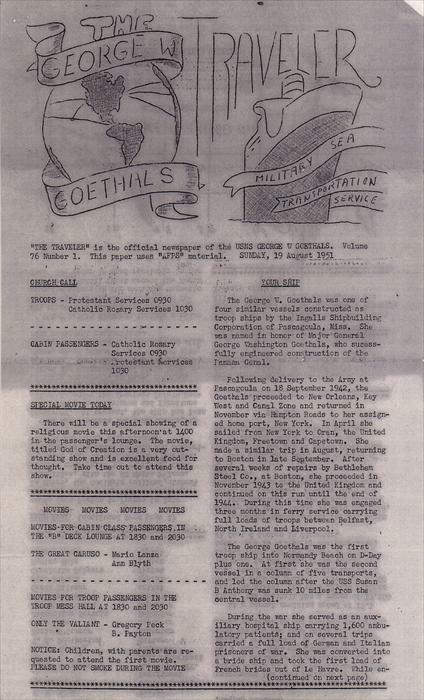 Page 3, USNS George W. Goethals (T-AP-182) Troopship Newsletter, August 1951. 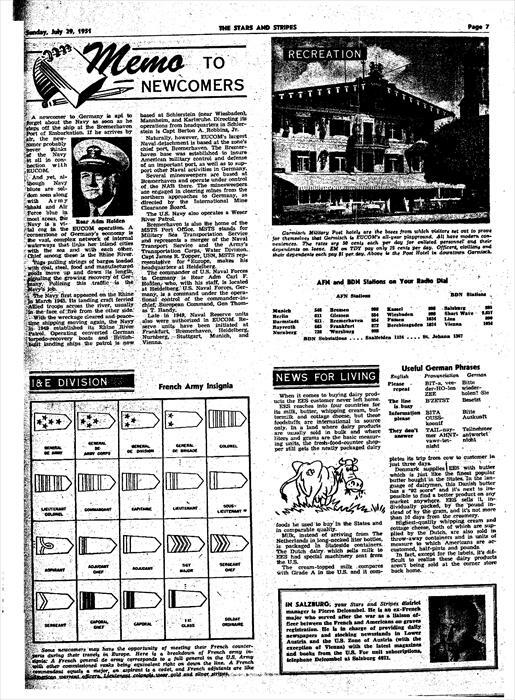 Six pages of Ken Klinger memorabilia-Page 1, USNS George W. Goethals (T-AP-182) Troopship Newsletter, Sunday, August 19, 1951. 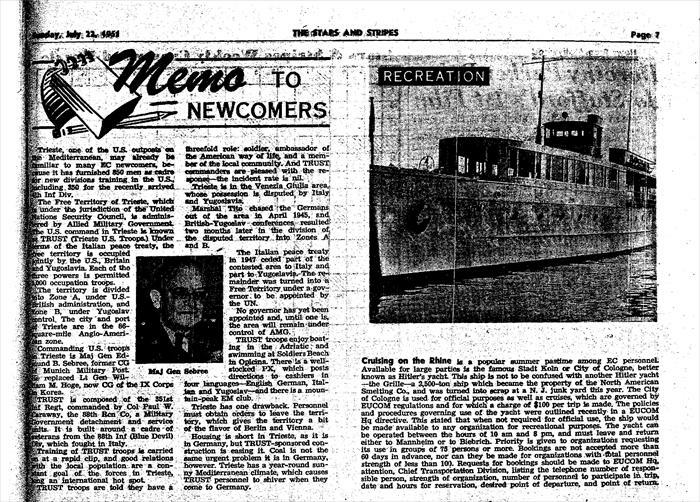 My dad and other men embarked from the New York Harbor on Friday, August 17, 1951. 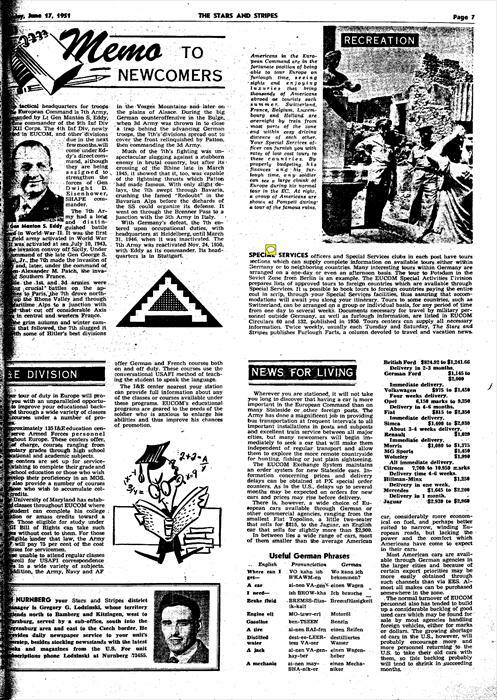 Page 2, USNS George W. Goethals (T-AP-182) Troopship Newsletter, August 1951. 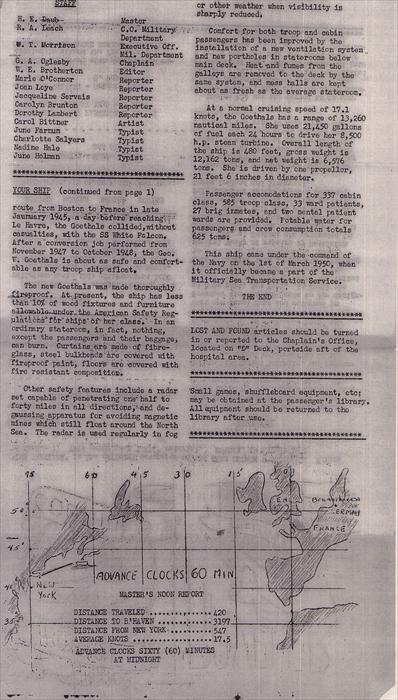 Page 4, USNS George W. Goethals (T-AP-182) Troopship Newsletter, August 1951. 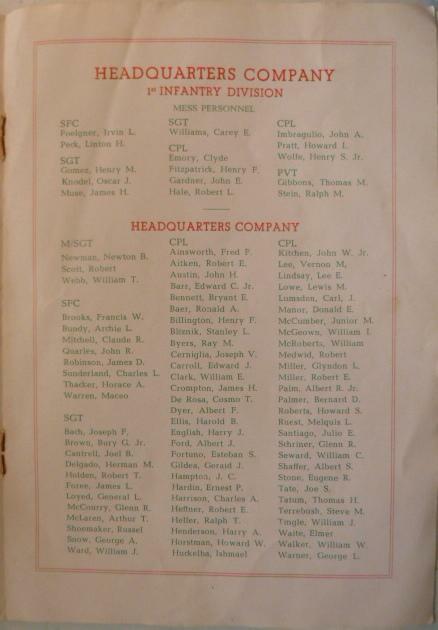 Ken Klinger memorabilia-Armed Forces Day at Camp Breckinridge, 1951, Back cover. 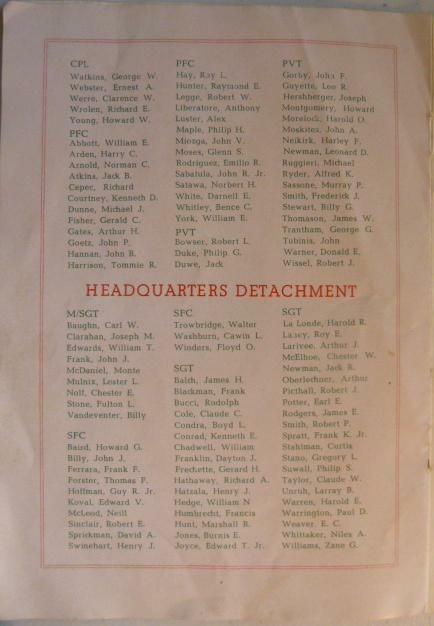 Ken Klinger memorabilia-Armed Forces Day at Camp Breckinridge, 1951, Back cover. 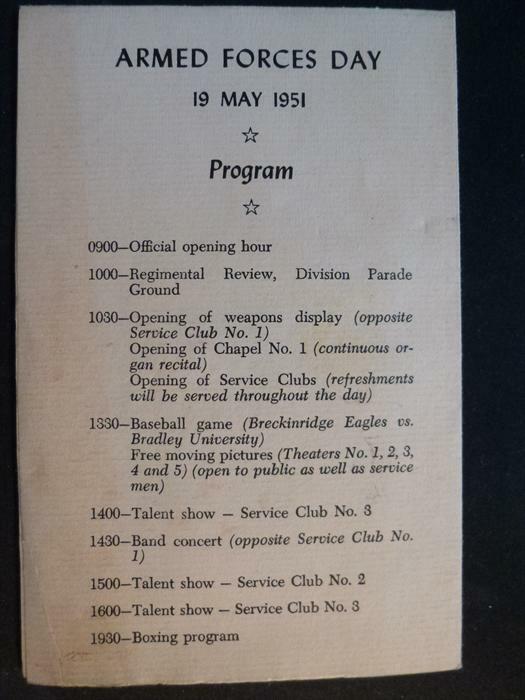 Ken Klinger memorabilia-Armed Forces Day at Camp Breckinridge, 1951, P. 2. 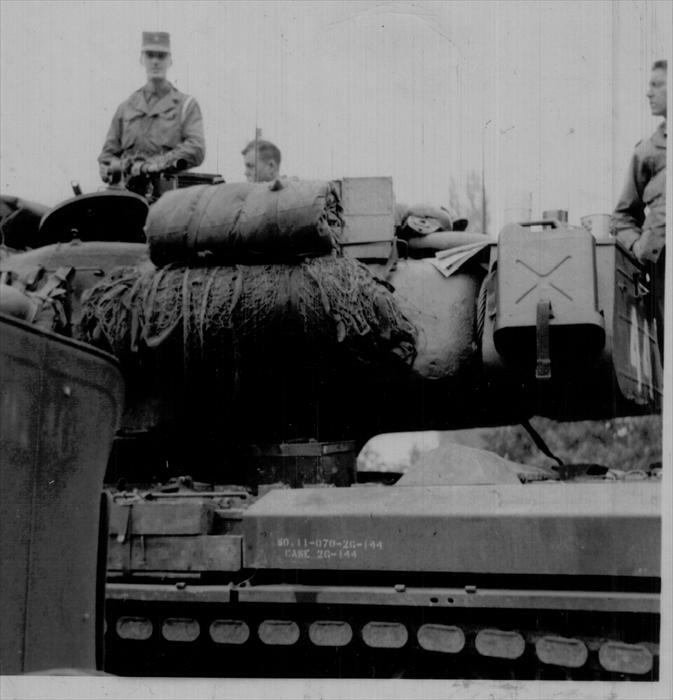 101st Airborne, 516th Reg. "G" Company Basic Training graduation photo. P. 2 of 5. 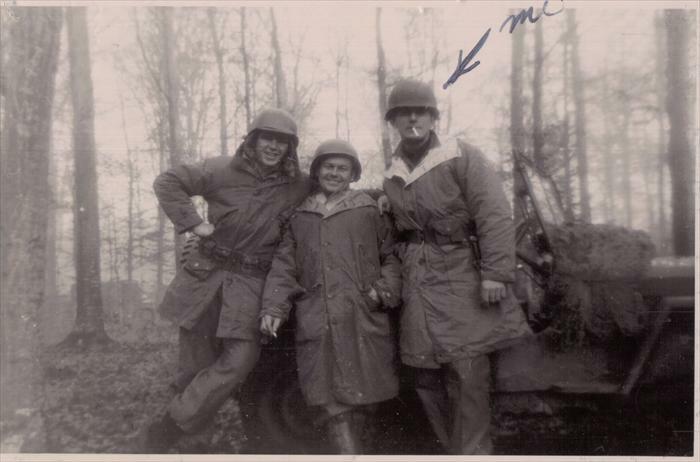 101st Airborne, 516th Reg. 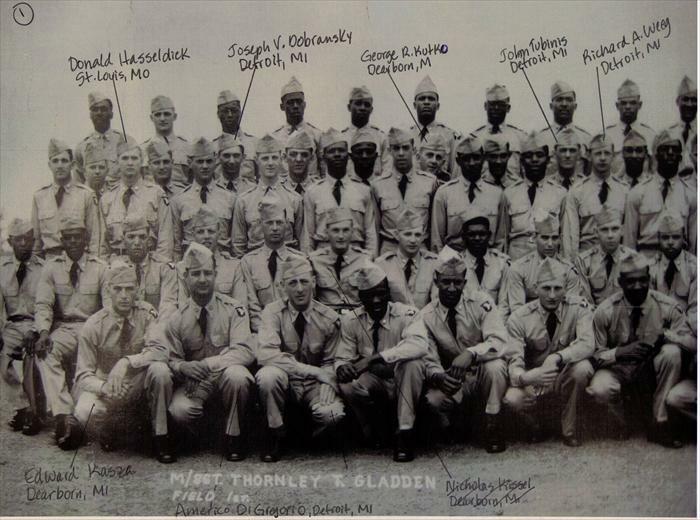 "G" Company Basic Training graduation photo. P. 1 of 5. The original photo is 8" x 36". Date of photo-Friday, June 8, 1951. A beer run was made to Morganfield that night. 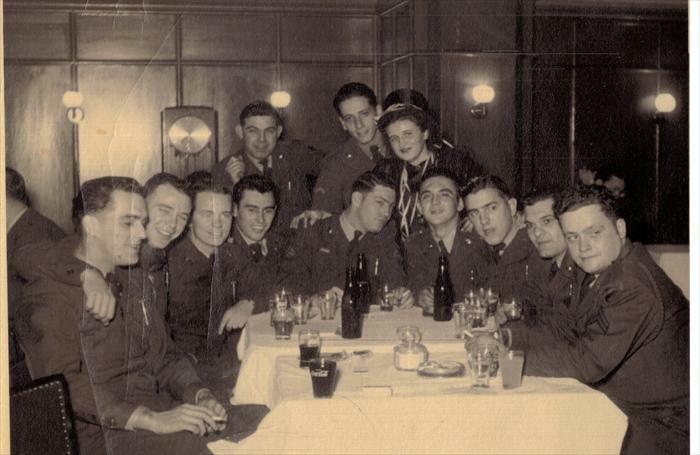 During roll call the next morning, officers asked the men to come forward responsible for the party. None came forward. Please contact the webmaster if any men are recognized. Thank you. 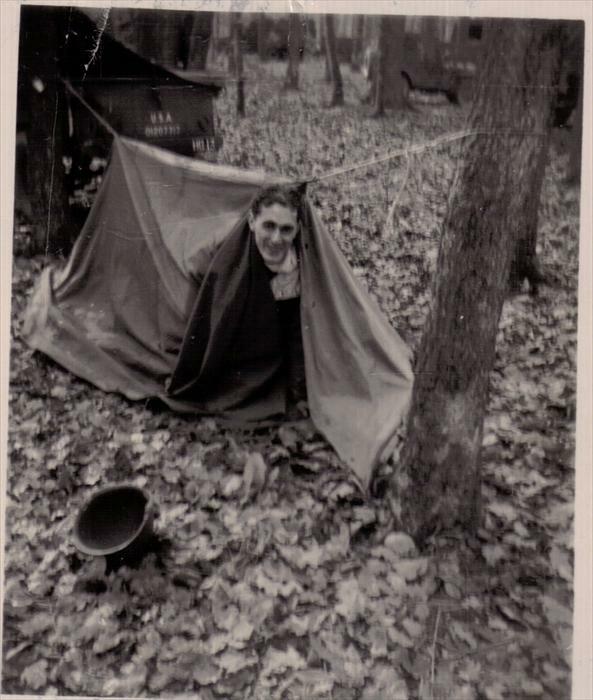 Dad at Camp Breckinridge. 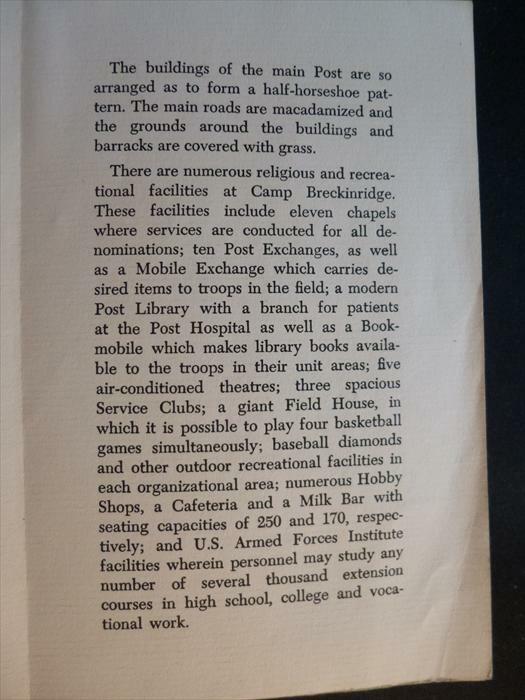 Camp Breckinridge, Morgantown, Kentucky. 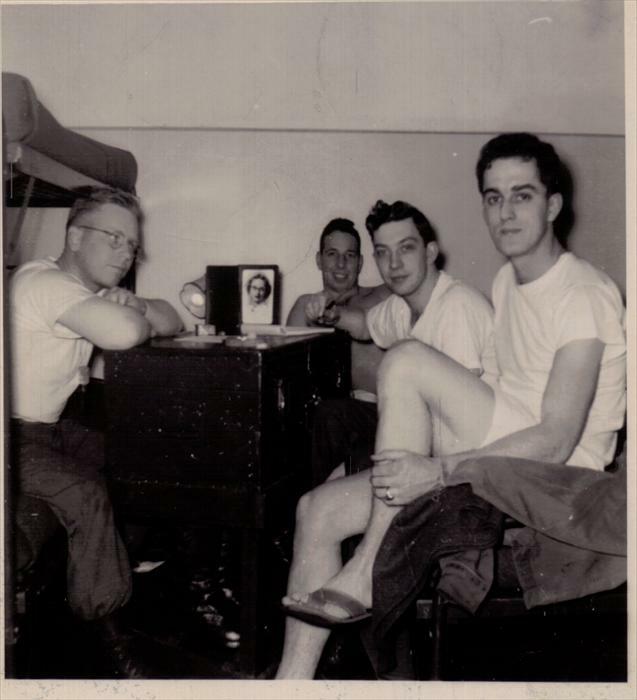 Dad, 21 years old, upper right. Other men unknown. 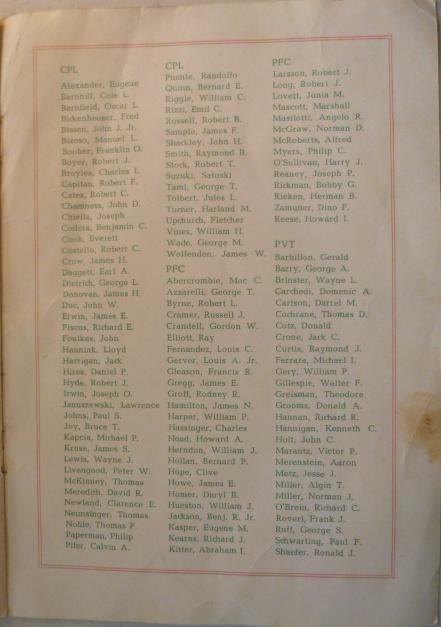 Dad was with Company G, 3rd Platoon. Road Seven was the location of this barrack. Note the Screaming Eagle patch minus the "Airborne" tab on the mens' shoulders. 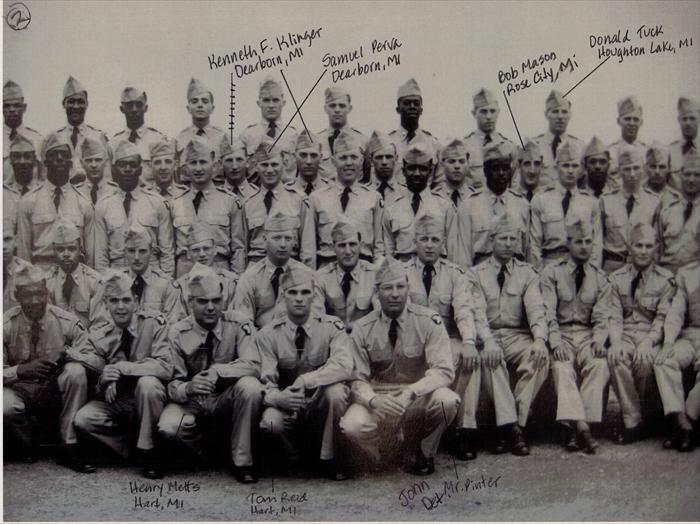 At the time of this photo, the 101st Airborne provided basic training not airborne training. 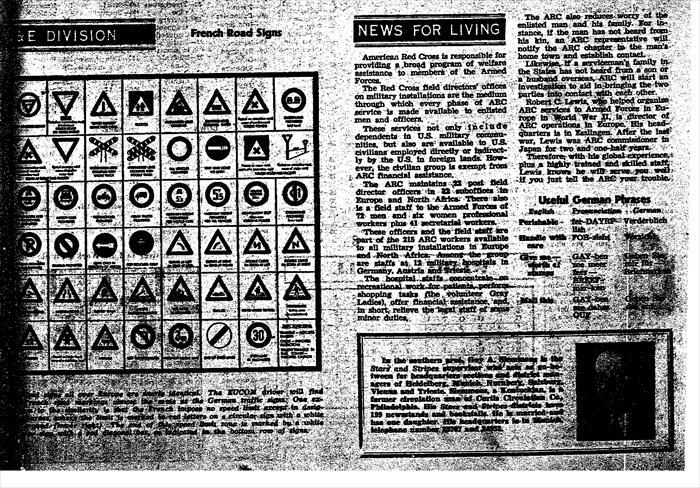 Mark Bando's site, http://www.101airborneww2.com/eaglepatchcorner.html, states WWII vets were angry that Basic Trainees were awarded the "Screaming Eagle" patch. 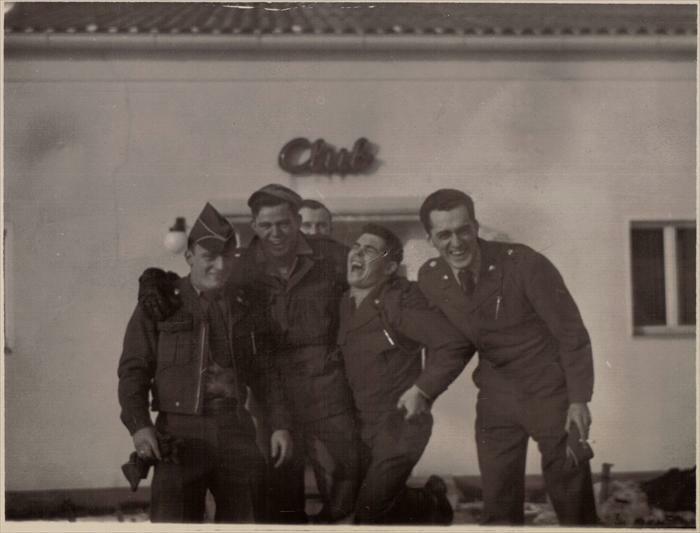 Here's a thought from Ralph Alvarez, Museum Technician, 82nd Airborne Division Museum, "Even though the 101st wasn't airborne when it was reactivated I am sure the cadre were airborne qualified and were hard on the troops. Being airborne doesn't make us any braver." Hoyt Bruce Moore, III, webmaster of http://www.506infantry.org, is certain Dad's Company G was part of either the 502nd, 506th, and 516th Airborne Infantry Regiments. 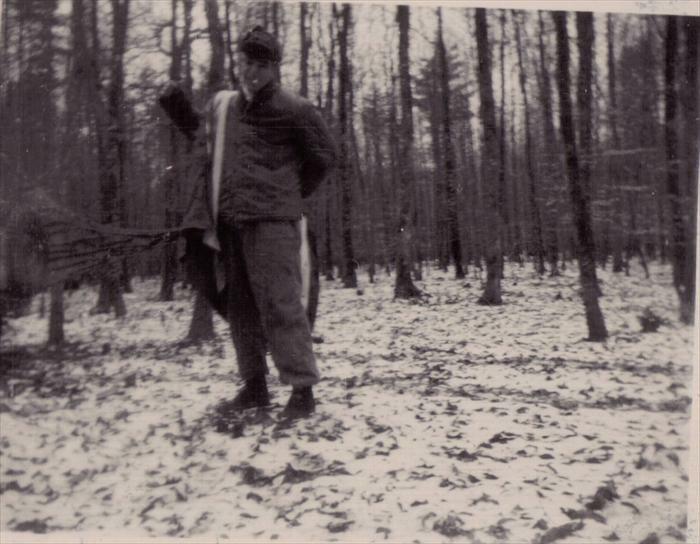 Here's another photo of Dad in fatigues at Camp Breckinridge. 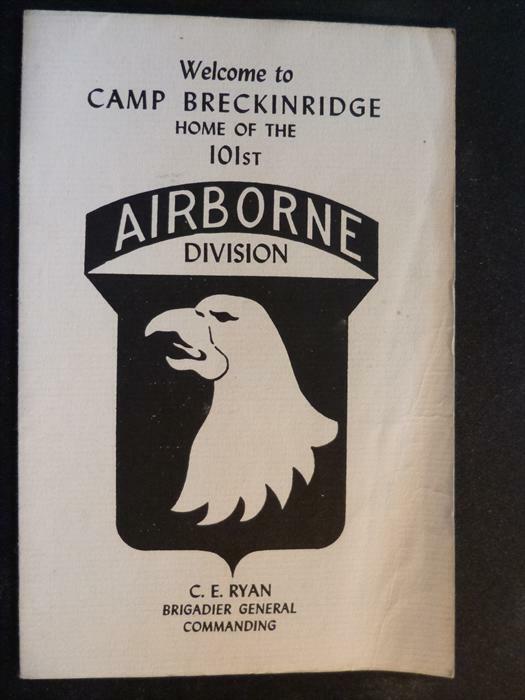 It's my understanding there are 101st Airborne Camp Breckinridge yearbooks. I've seen a 1949 yearbook for sale on eBay. 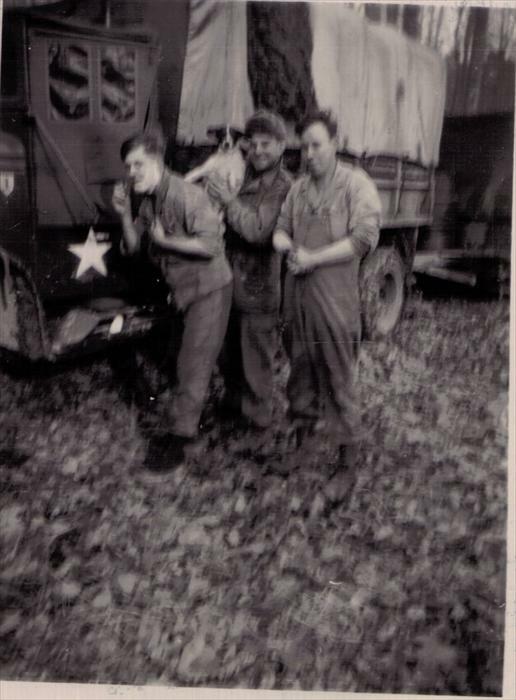 There were also photos taken of the G Company, 502nd, 506th and 516th Airborne Divisions. 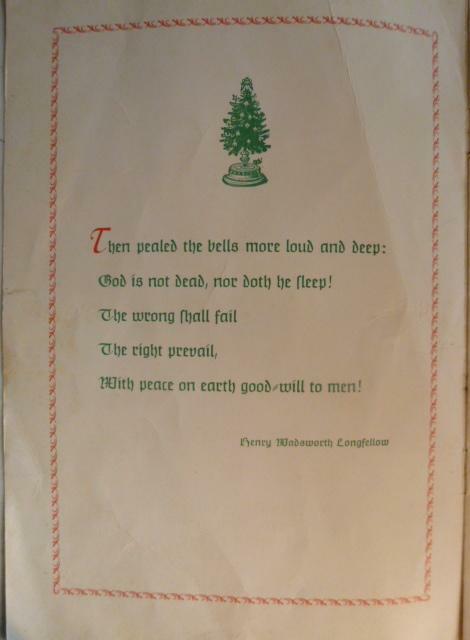 I came across one from January 1951 a few months prior to my dad's arrival. If anyone has info on the time my dad trained, please contact me. Dad wrote "That's me on the ground. With my posing ability, I should be in Hollywood. Ha! Ha!" The famed guard house in the background. This photo may have been taken further into Basic Training. Note leaves on trees compared to other photos. 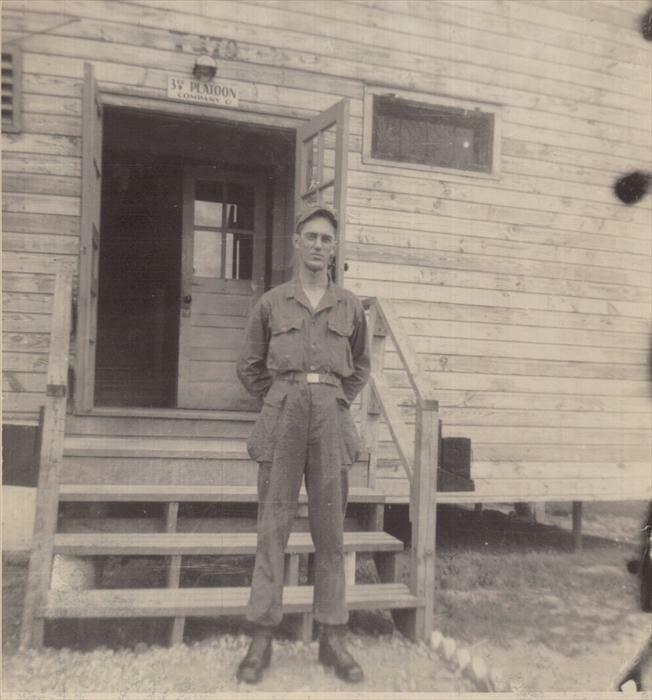 My dad's DD214 shows that he was promoted to a PFC January 28, 1952. 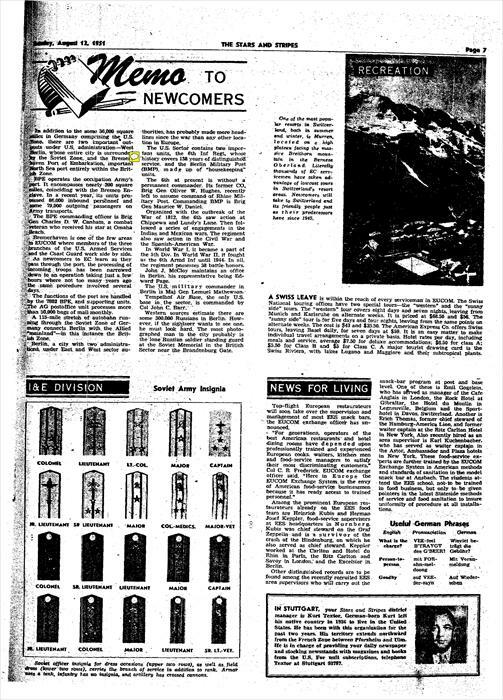 I found an article in "Stars and Stripes" that Privates were automatically promoted six months following Basic Training. 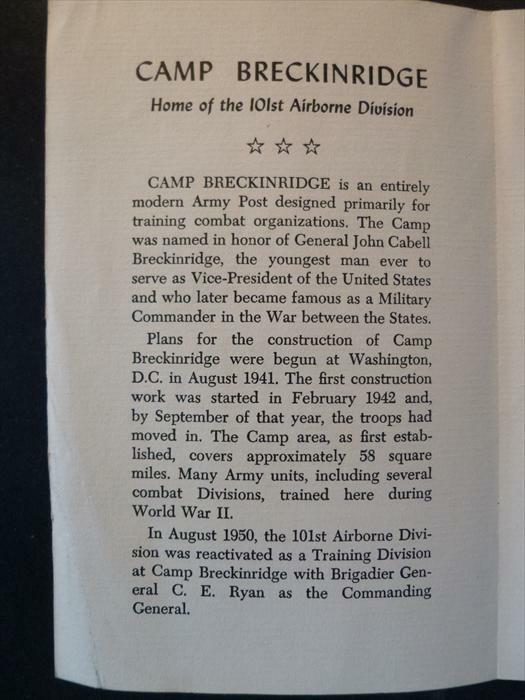 Based on this information, my dad completed Basic Training at Camp Breckinridge July 28, 1951. It's possible he also had Advanced Training at Camp Breckinridge. I await a confirmation. 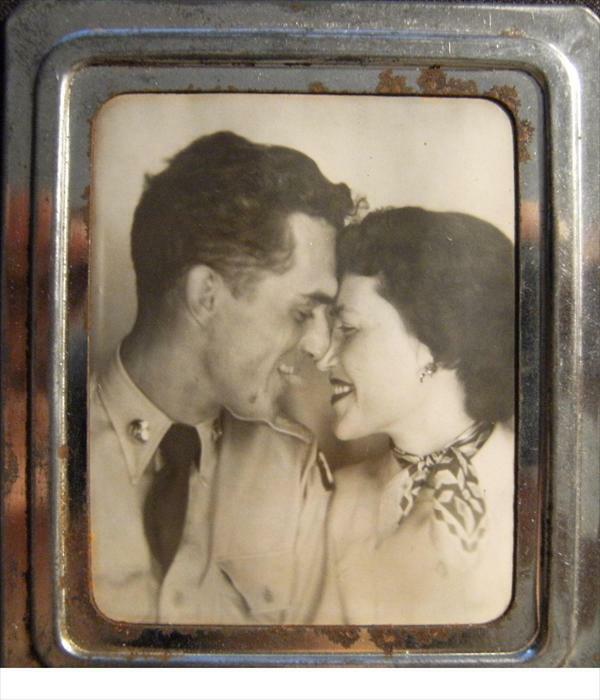 Dad and Mom-most likely taken soon after my dad completed basic training returning to Detroit. 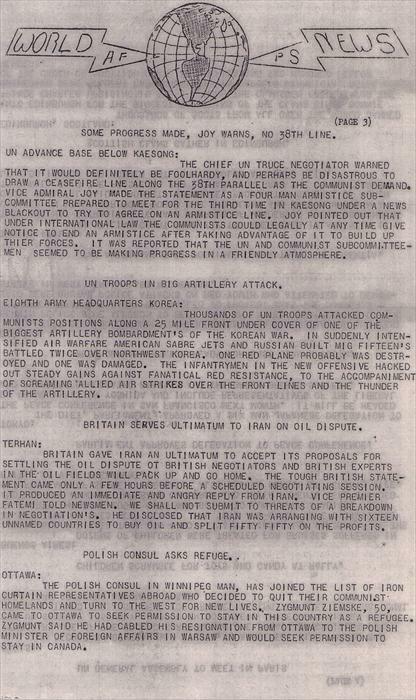 Late July, early August 1951. 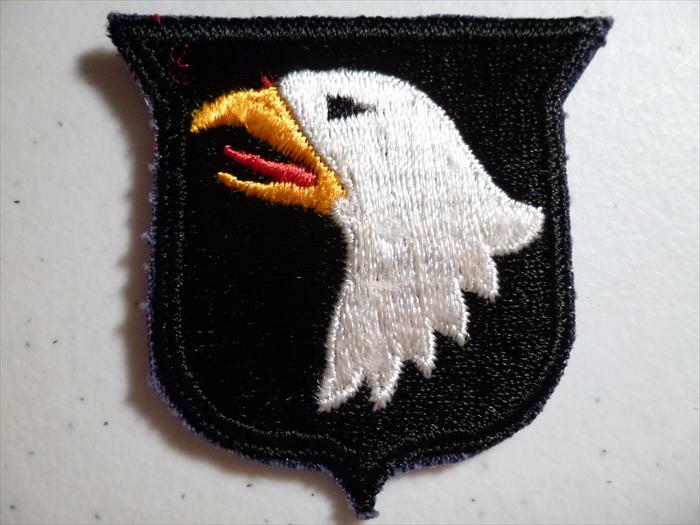 Take a look at this website: http://www.506infantry.org/index.htm Look for the Screaming Eagle patch minus the airborne tab. 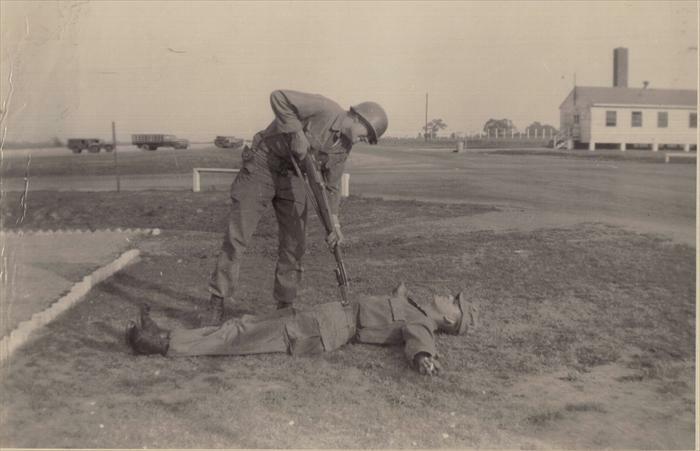 This site has great information and photos of Basic Training 1948-1949 and 1950-1953. 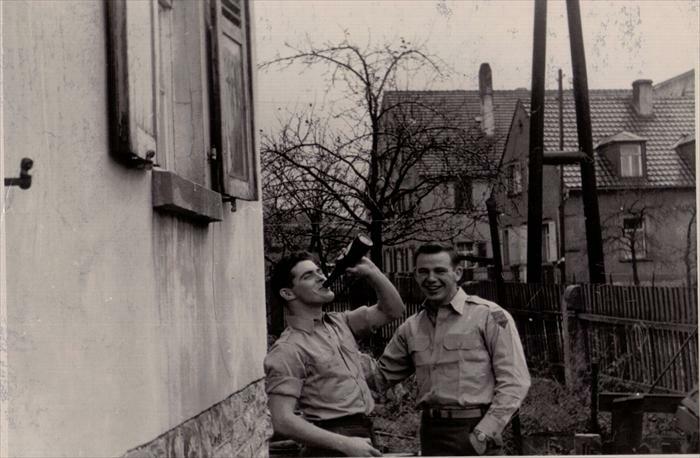 Since my dad rarely talked about his training and time in Germany, my respect for him deepened after seeing this. 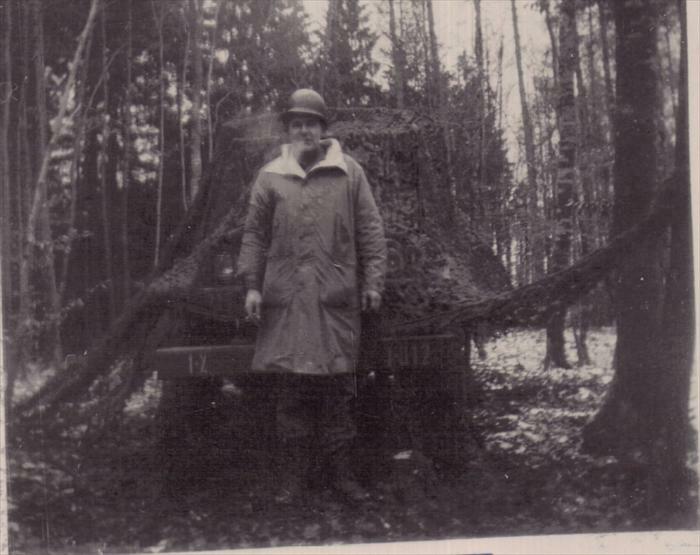 Dad in fatigues in front of his barrack. 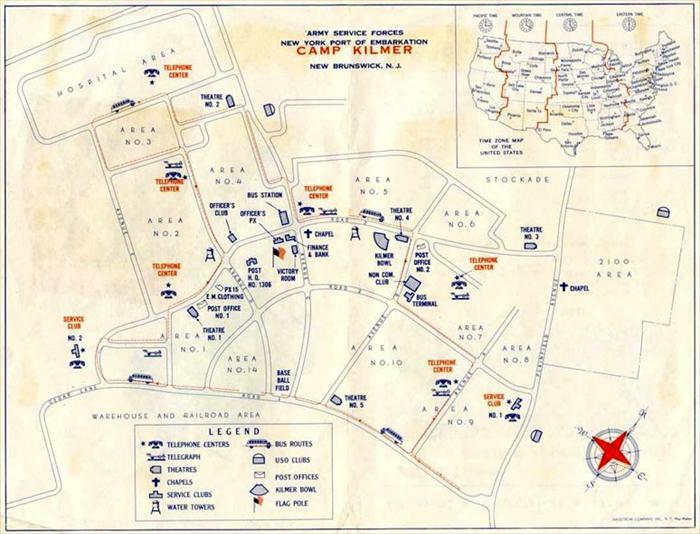 Camp Breckinridge, April-July 1951. 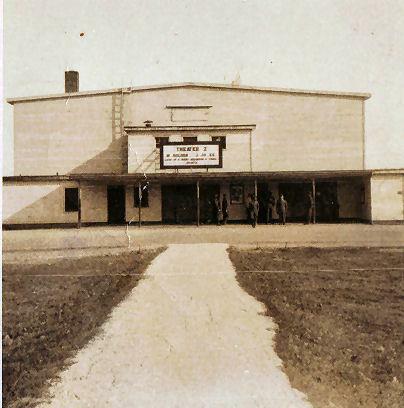 Army Theater, Camp Breckinridge, 1948. Source: http://ad4dx.com/images/indexAa54.htm Dad-Camp Breckinridge. April-July 1951. Here's Dad. "The building you see is the guard house. The guards sleep there. So far I have not had the honor of being on guard duty." 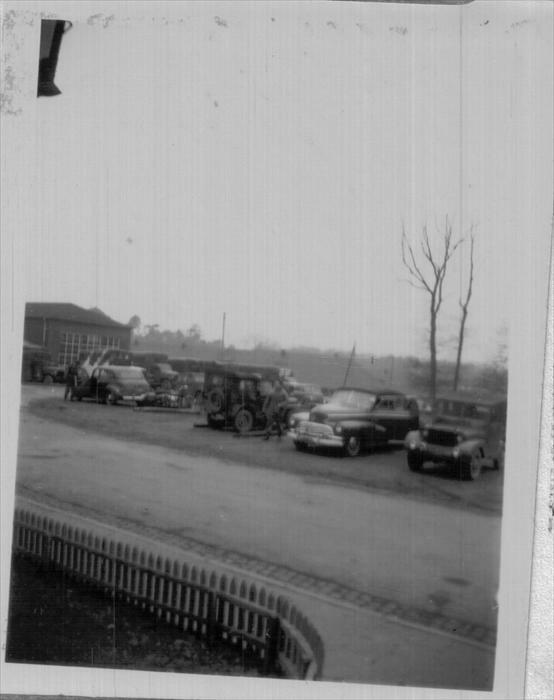 Photo taken April (possibly), May, June or July 1951. The "Guess Who?" was directed to my mom, back in Detroit, MI. Go to www.wartimepress.com for a history of Camp Breckinridge. Look under "United States Air Fields, Camps and Forts." Cambrai Fritsch Mechanics area. Cambrai Fritsch Kaserne. This is the barrack Dad called home. Stretch on maneuver 1951-1953 Smitty, Dad, Stretch on manuever 1951-1953 Dad -right and unknown soldiers. Cambrai-Fritsch, Darmstadt or Northern Kaserne, Wuerzburg, Germany. 1951-1953. Dad,? 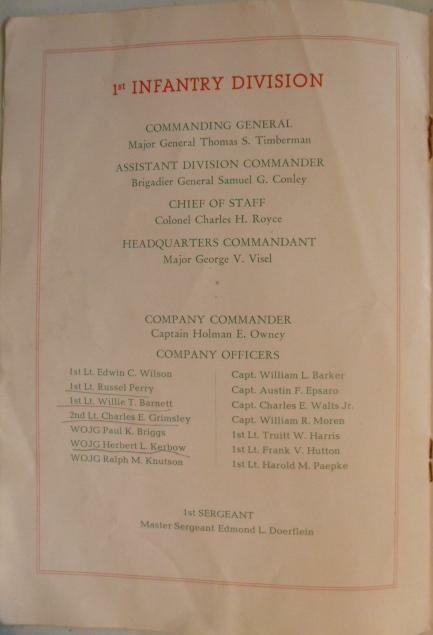 and Werre, 1st ID Hq Co men on manuever 1951-1953 Dad, and Smitty, 1st ID Hq Co men on manuever 1951-1953 Dad wrote "Lt. Grimsley our section officer. He's a real swell guy." 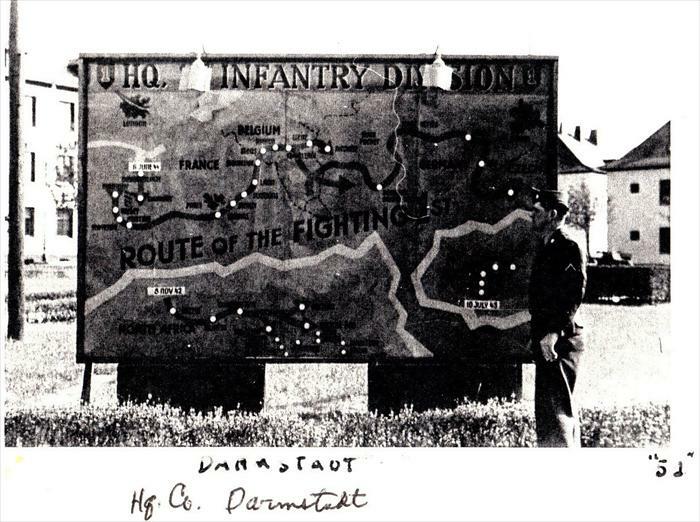 Cambrai Fritsch Motor Pool. 1951-1952. 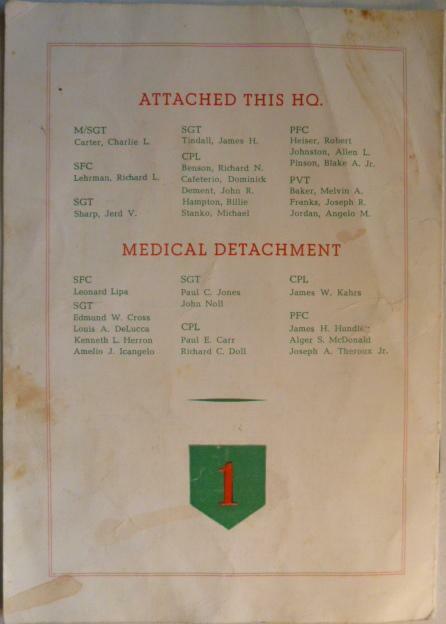 1st Inf Div. Hq. 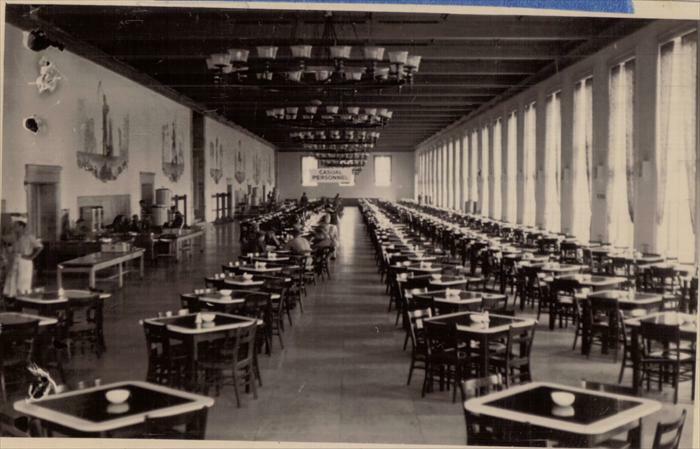 Cambrai Fritsch Mess Hall. Note Coca Cola truck. 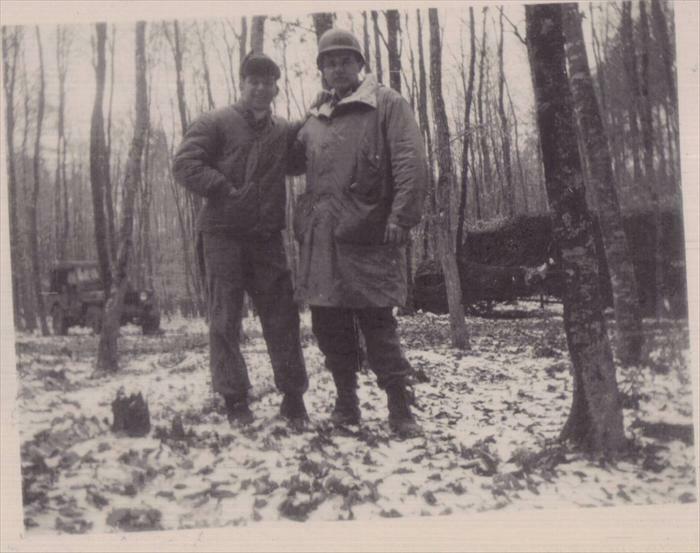 Left-MG Thomas S. Timberman, 1st Infantry Division CG (July 1951-December 1952) Right-BG Eric S. Molitor,1st Divarty CG Photo taken on a maneuver in Germany 1951-1952. 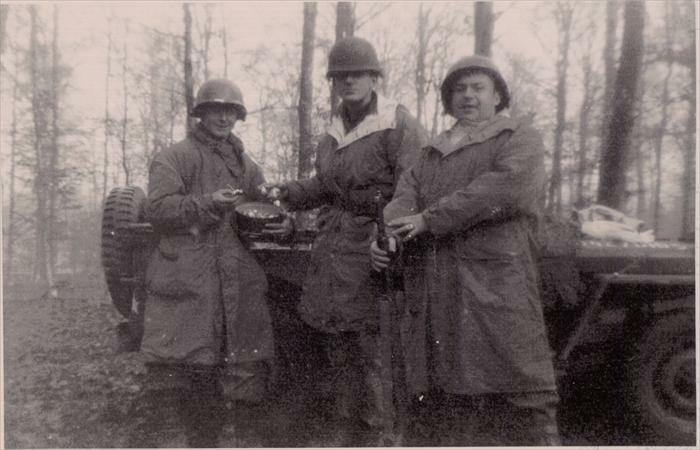 John Tubinis with 1st Division HQ CO soldiers. Probably 1951. Darmstadt, Germany Service Club. "Smitty" drapes his arm around Dad's shoulder. 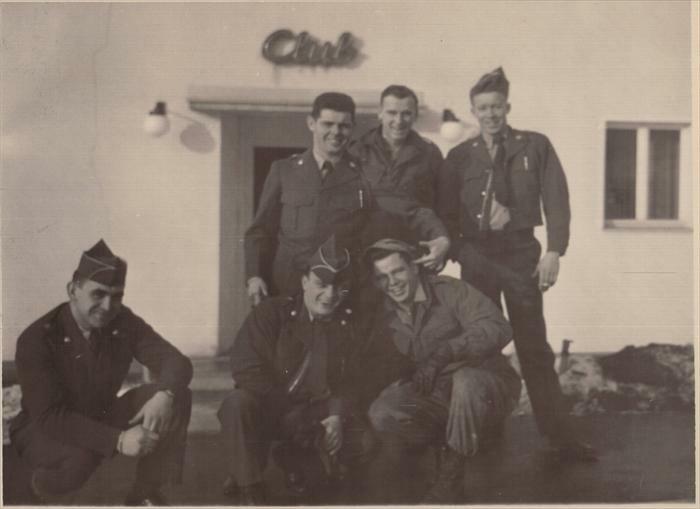 Dad, (John Tubinis), second left, with 1st I.D. HQ CO men at Service Club. 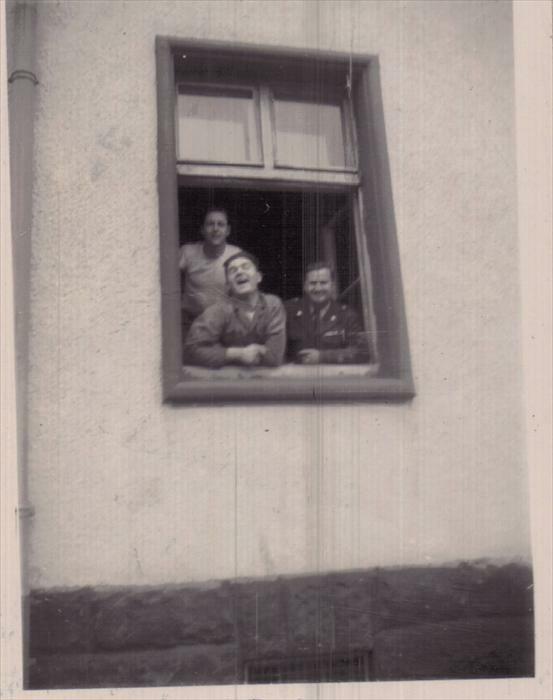 Most likely Darmstadt, Germany 1951. Smitty with his arm draped around soldiers. 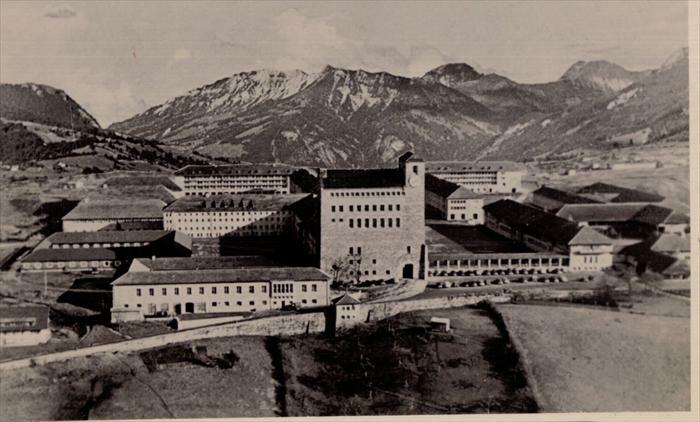 The estate was built in 1934 as NS-Ordensburg Sonthofen by the German Labour Front (Deutsche Arbeitsfront) for the NSDAP. 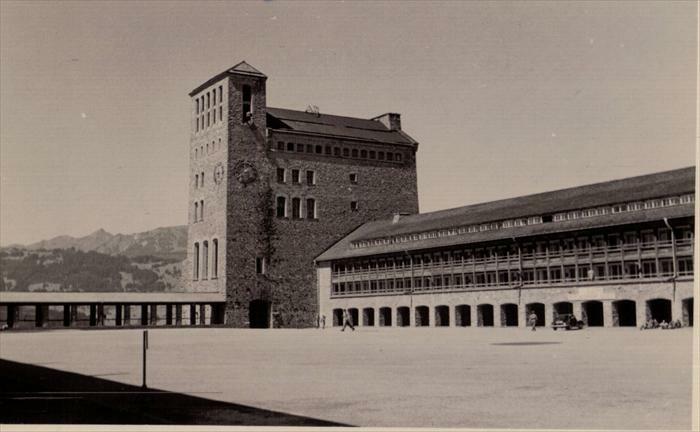 It was planned by architect Hermann Giesler. 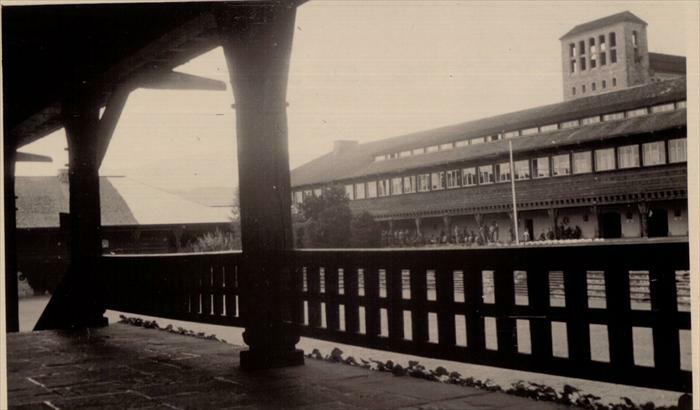 It served as Adolf-Hitler-School for the education of party cadres. In the last year of the war it was used as sickbay. After the war at first French troops acquired the Castle. Later the US Army created a the central educational place of the task force US-Constabulary there. 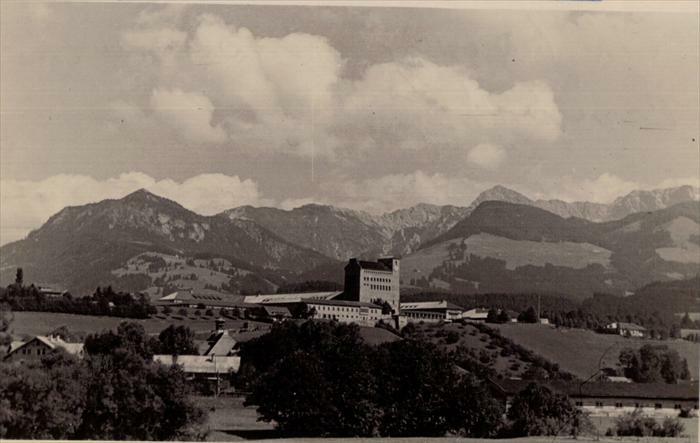 In 1956 the Castle was acquired by the Bundeswehr and was named after the member of resistance and former chief of the general staff of the army General Ludwig Beck. 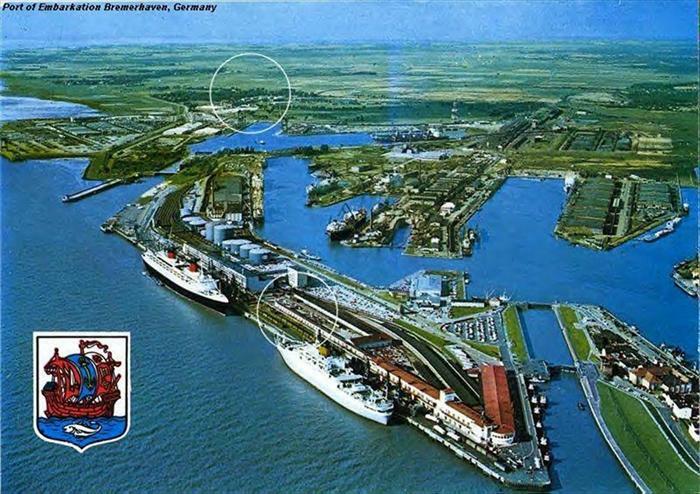 The A307th Replacement Battalion (arriving late 1950) orientated men after a 20-hour train ride from Bremerhaven Port of Embarkation. Orientation lasted about 4-5 days. 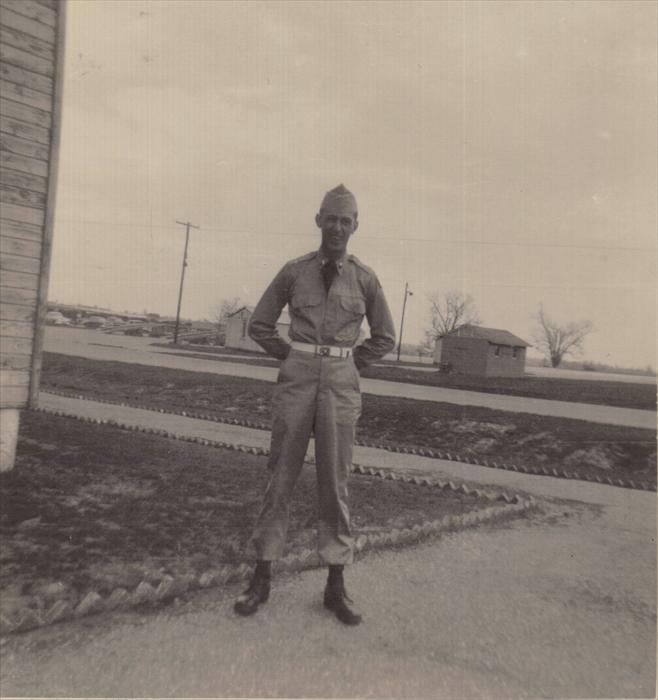 Then my dad was sent to his permanent unit, 1st I.D. HQ CO in Darmstadt, Cambrai Fritsch Kaserne. 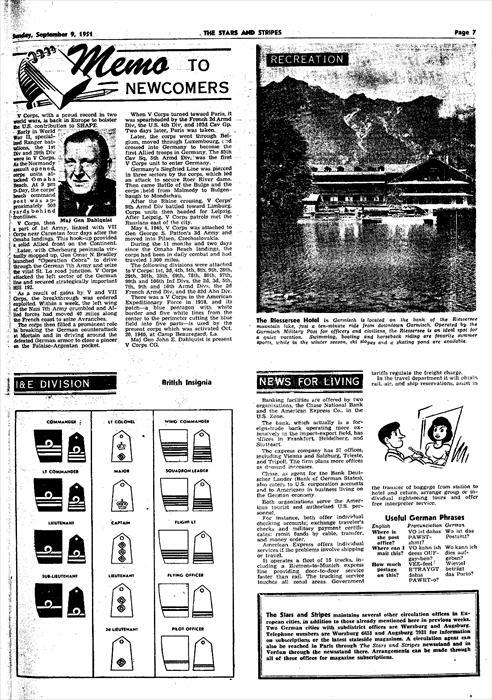 He began with HQ CO on Sept. 3, 1951. 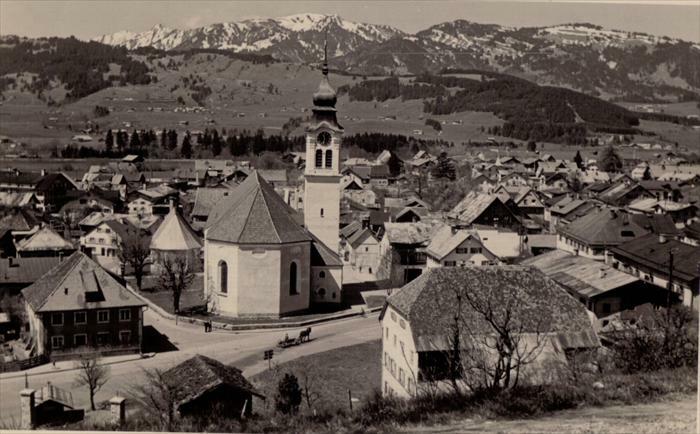 City of Sonthofen. 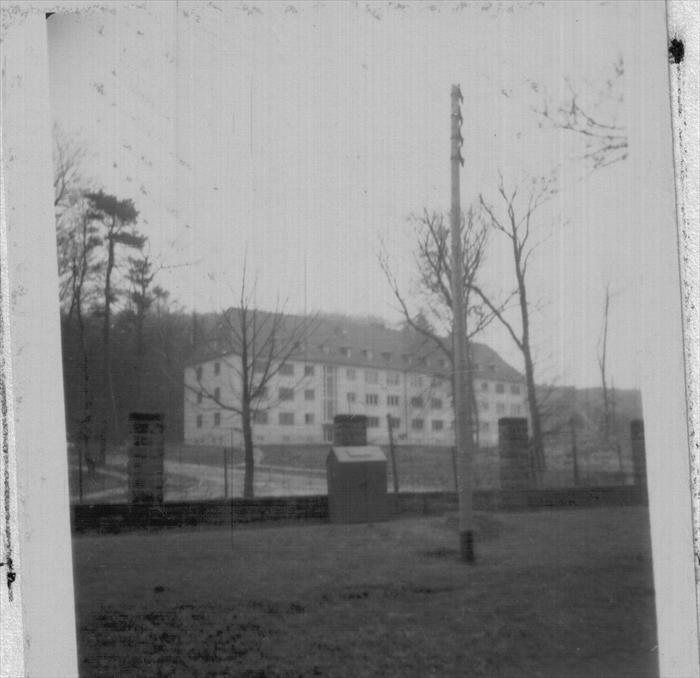 Sonthofen Camp August 1951. 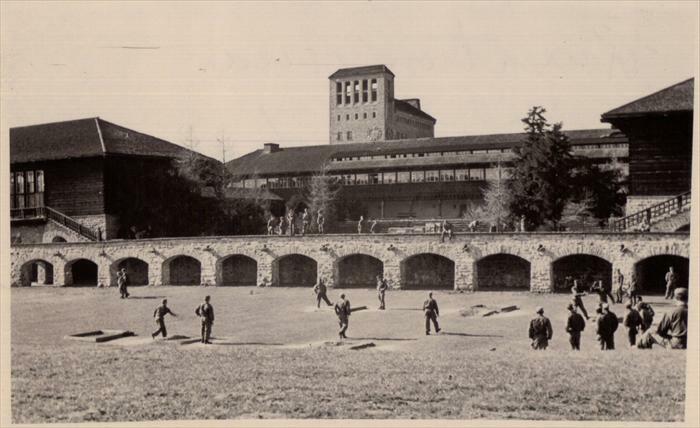 Football and baseball fields at Sonthofen. 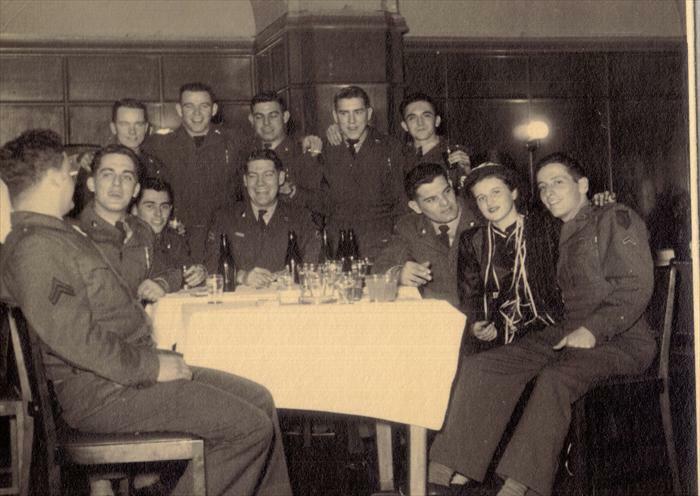 The mess hall at Sonthofen. Dad wrote on the back of the photo "Everything was steamed cooked." Sonthofen Service Club. August 1951. Sonthofen Camp Chapel. August 1951. 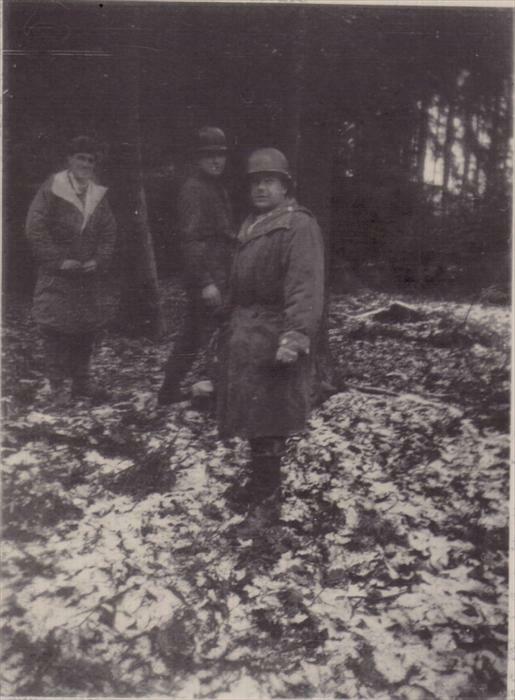 Sonthofen Parade Ground. August 1951. Sonthofen recreation area. August 1951. 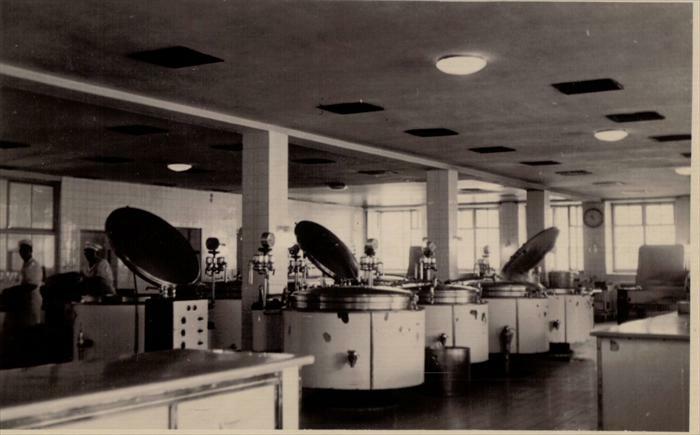 Sonthofen mess hall. The murals may have been added after U.S. Constabulary left. 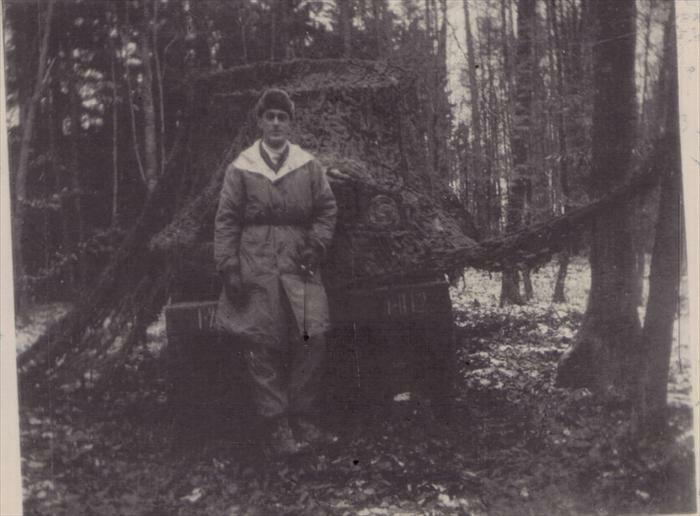 John Tubinis, PFC, 1st ID HQ CO, standing in the turret of a M-34 tank carrying a 50-cal. machine gun. A warm weather maneuver. Dad umpired as indicated by the white engineer's tape around his left shoulder. Germany 1951-1953. 1st Inf. Div. soldier and with the company mascot. The photo was taken in Wuerzburg near the Löwenbrücke (Lion Bridge). 1st Inf. Div. 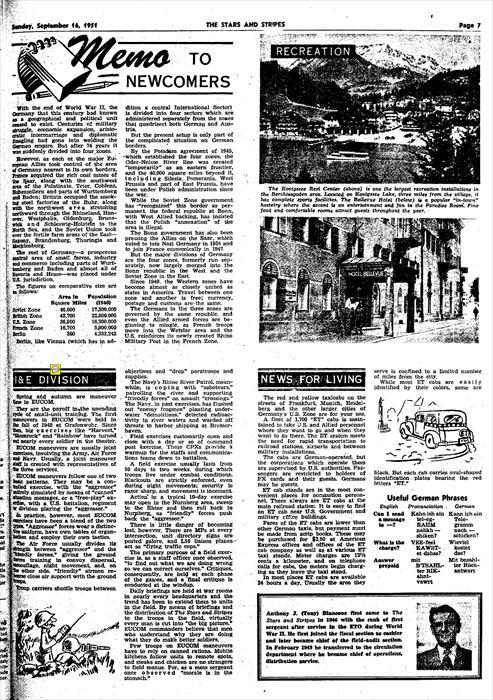 moved from Darmstadt to Wuerzburg the latter two weeks of September 1952. 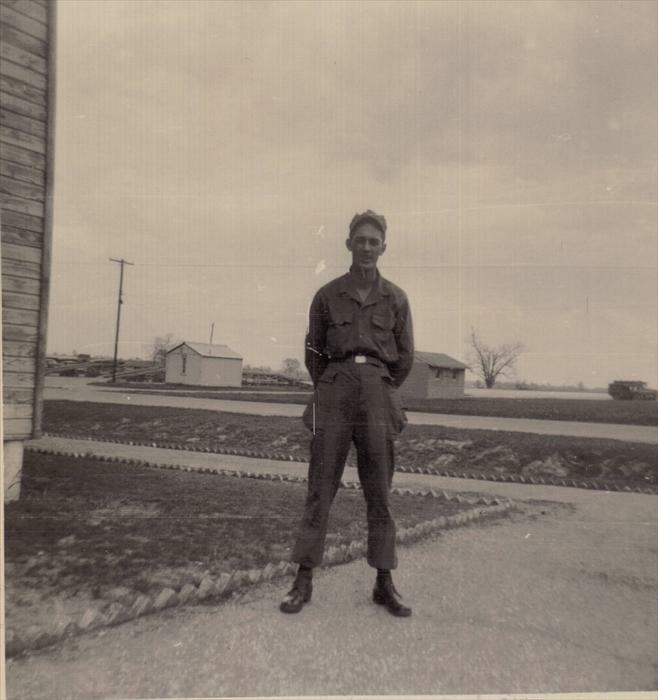 This photo was taken some time after and before my dad returned to the States in March 1953. 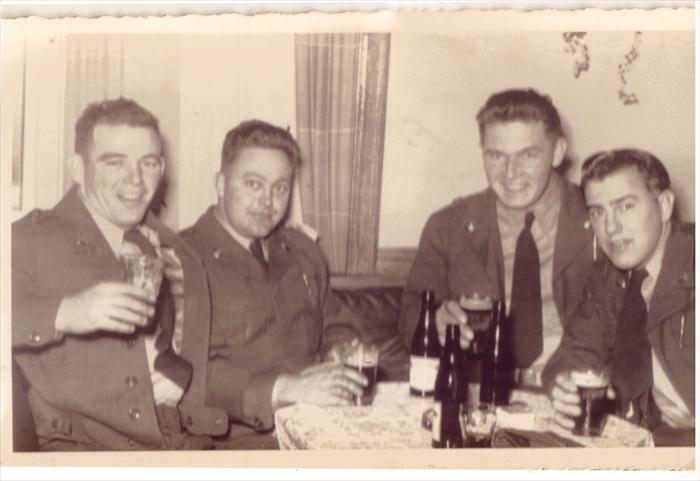 Photo of Dad's buddies most likely 1st Inf. Div. Hq Co. Smitty wearing a cap partially turned away from the camera. 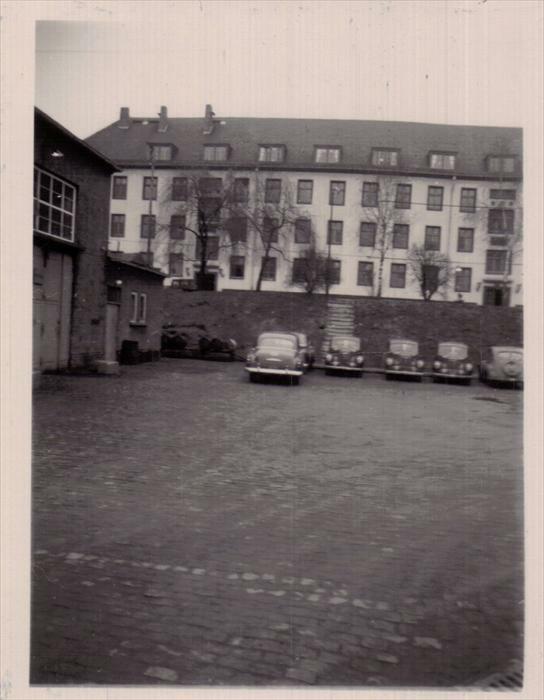 Not sure if this photo was taken at Cambrai Fritsch Kaserne, Darmstadt or Northern Kaserne, Wuerzburg. 1951-1953 Germany. 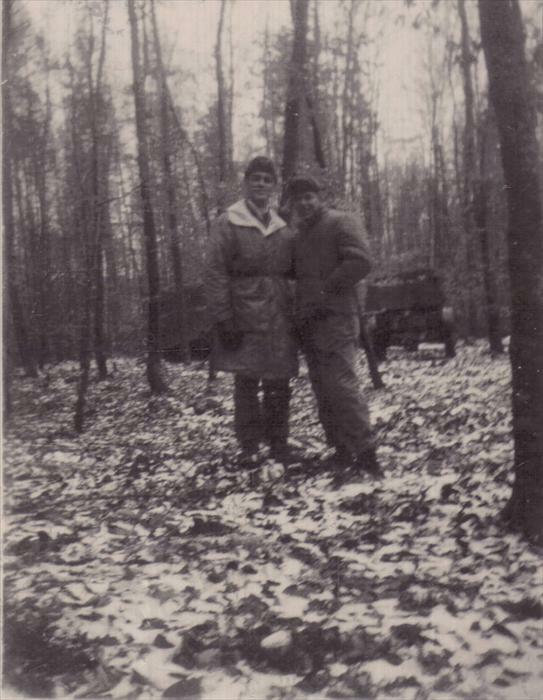 John Tubinis, PFC 1st ID Hq Co, right. Two buddies in the center seen in separate furlough photos. Another photo of the guys in front of the club. 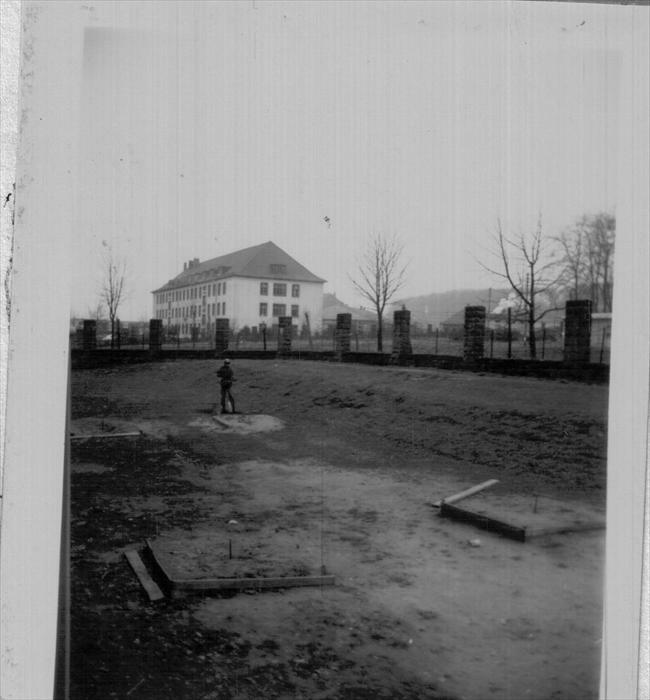 Darmstadt or Wuerzburg Germany 1951-1953. Smitty and unknown soldier. Unable to identify Smitty's shoulder patch. Taken possibly on furlough. Dad's and Smitty's buddy. Barrack Dad called home. Cambrai Fritsch, Darmstadt. 1st ID HQ. 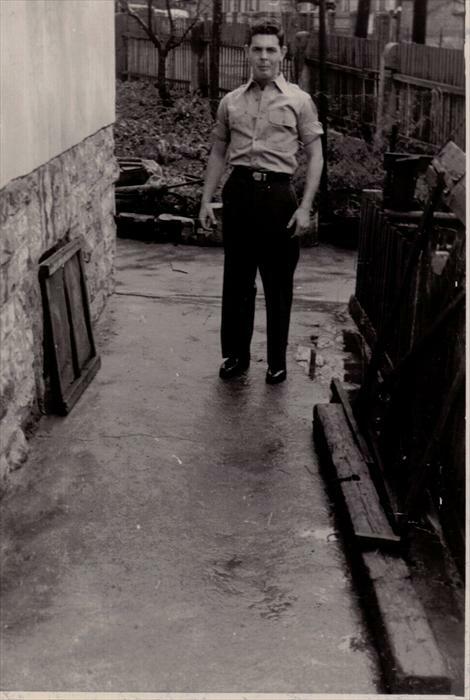 Photo between his arrival in September 1951 and the move to Wuerzburg, September 1952. Cambrai Fritsch Kaserne. 1951-1952, Darmstadt, Germany. 1st Inf. Div. Hq. Cambrai Fritsch Kaserne. 1951-1952, Darmstadt, Germany. 1st Inf. Div. Hq. Clock tower and motor pool. 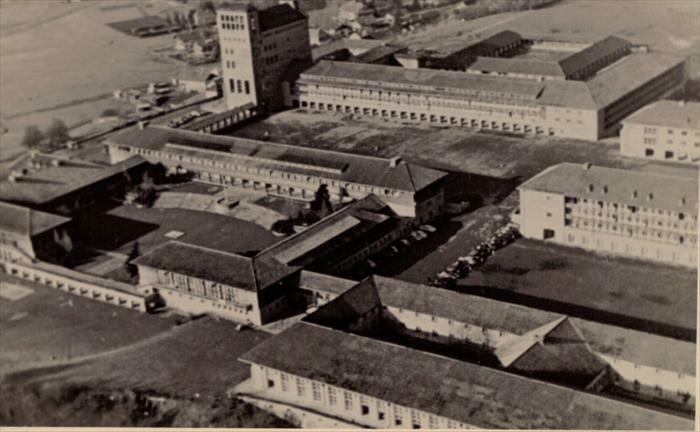 Cambrai Fritsch Kaserne 1951-1952. Darmstadt, Germany.